Annie Robertson Kippax was my great grandmother, who married William Robson M.L.C. She was given the middle name Robertson and when I collected her death record I felt that it was probable that her mother’s maiden name was Robertson. I had never heard of the Robertson name in our family before my research into the family tree in 2011. 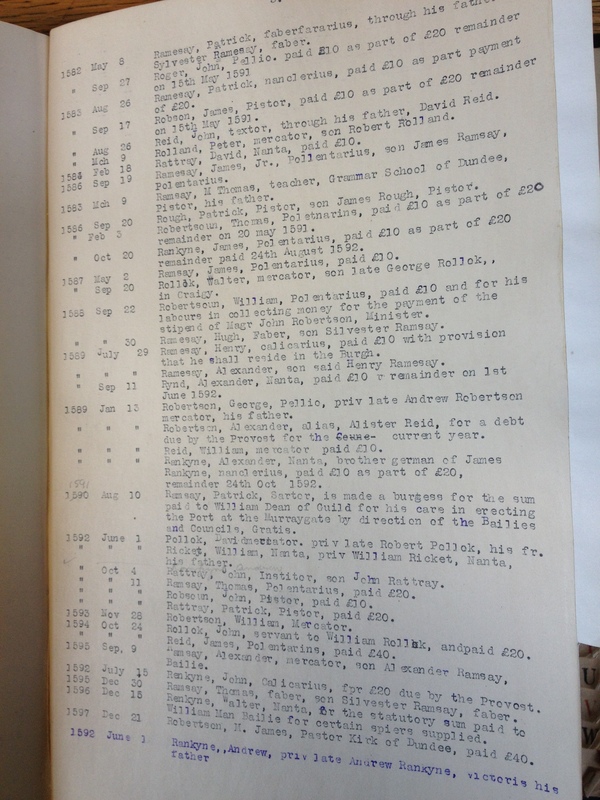 I then went looking for William and Elizabeth Kippax’s marriage record and confirmed that this was the family branch I was looking for. In other family chapters, The Kippax Family and The Robson Family of Sydney I have placed an old photo that my father had in his collection. It mentioned Elizabeth Kippax of Dundee. I was sure that this branch of the family was about to take me back to Dundee in Scotland. 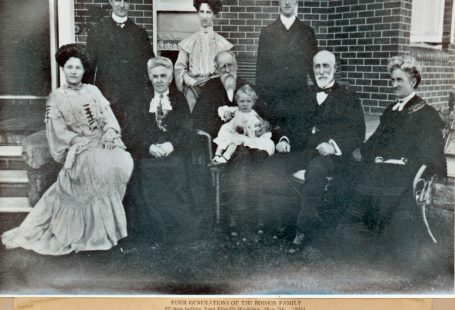 When I checked the caption on the photo it read “Elizabeth Kippax (nee Robertson – born Dundee).” Elizabeth Kippax is sitting in the middle and her husband William Henry Kippax to the right, holding their great grandson, William “Alan” Robson, my father, Reginald “Reg” Robson’s eldest brother. 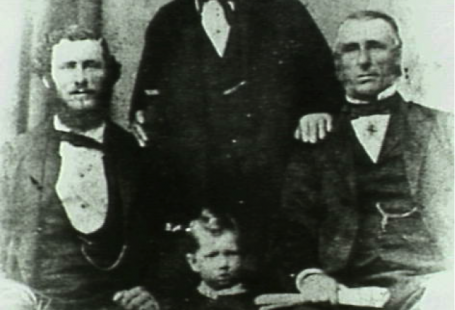 William Kippax was born in Sydney on 29 March 1827, the son of a convict Richard Kippax and his wife Hannah Howell. 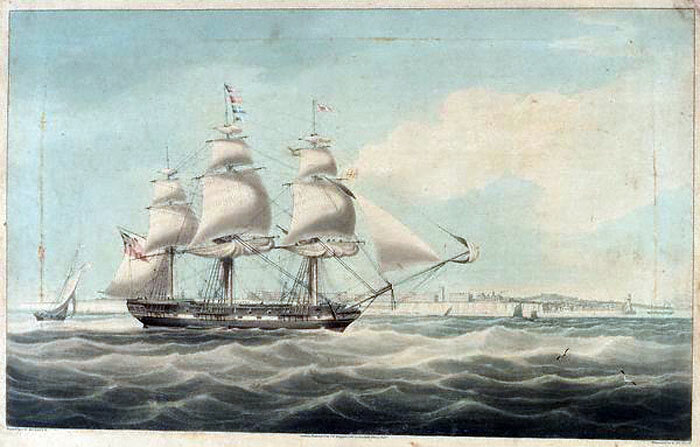 She was the daughter of a convict, Samuel Howell from the Second Fleet which arrived in Sydney Cove on 28 June 1790. 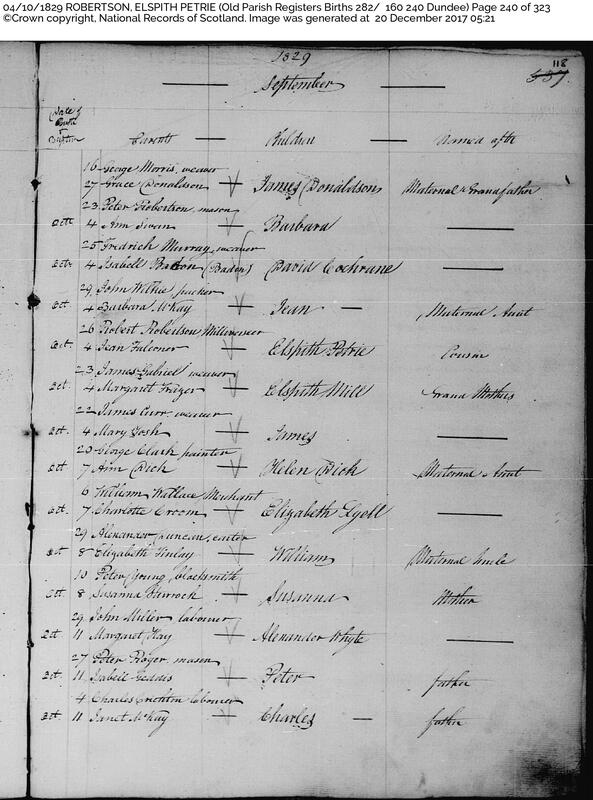 The interesting thing about our convict connection was that no-one in our family knew, until I found the transportation records in 2011. 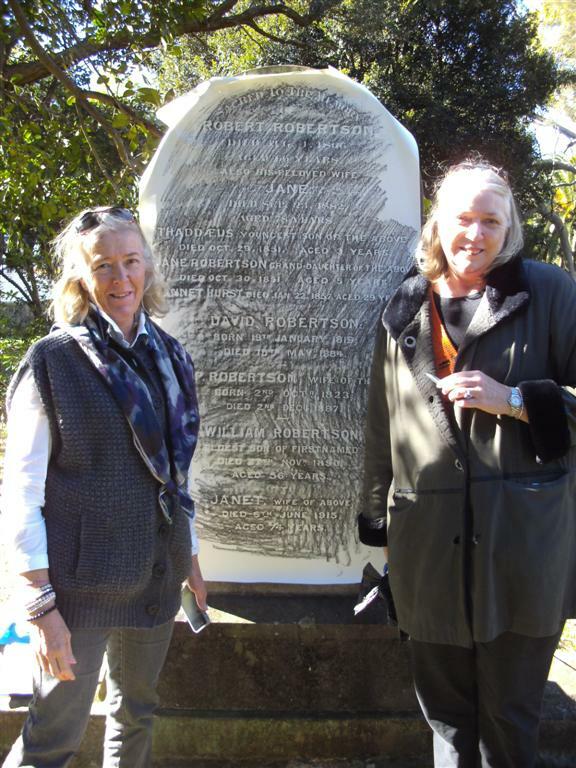 My sister, Lavinia Chrystal and I are convinced that our dad Reg Robson did not know we had convict heritage and he used to quite confidently and honestly state that there were no convicts in our tree, despite our early connection to the Colony of New South Wales as sixth generation born Australians. I am sure a “cover up” occurred sometime around the turn of the last century, and this information may even have been kept from my grandmother, Mabel Jackson Wise, who married W.E.V. 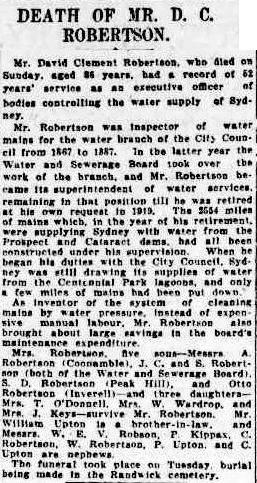 Robson on 21 December 1901. Mabel Wise’s ancestry came down from some of the noble and royal families of England and Ireland and she may not have taken kindly to the thought of a convict past in her husband’s Kippax family. It has occurred to me that Elizabeth Robertson, who married into the Kippax family may have adopted the signature line, “Elizabeth Kippax from Dundee” to separate her from the rest of the family! I am equally sure she was very proud of her Dundee origins. As I placed Robert Robertson and his wife Jane into my growing family tree on ancestry.com I was getting information that other researchers were looking and accepting the same documents that I was finding and the information seemed to back up my discoveries. 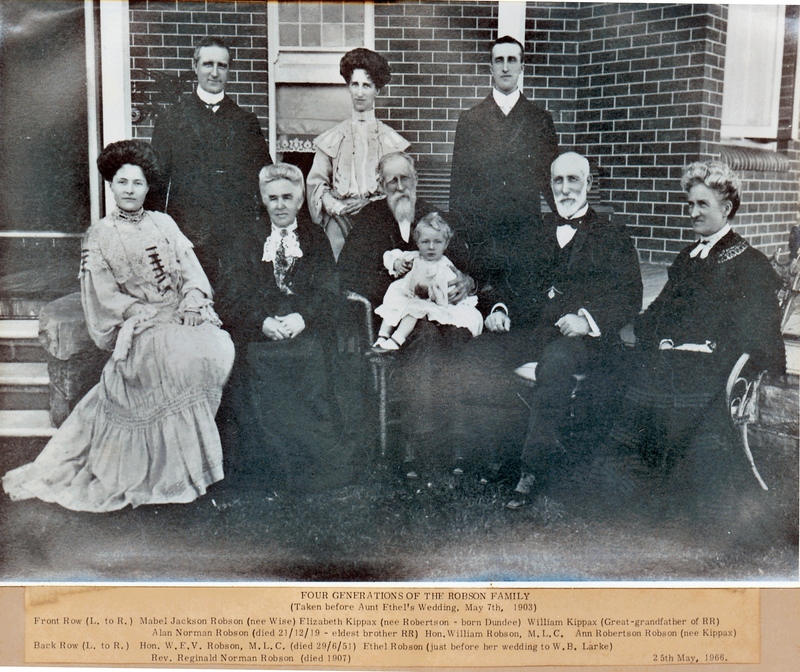 Robert and Jane Robertson had a large family of eight children; Ann Patrick Robertson 1823-1887, Jannet Robertson 1826-1856, Elspeth Petrie Robertson 1829-1904, Elizabeth Whitton Robertson 1832-1910, William Patrick Robertson 1834-1890, Eliza Waugh Robertson 1838-1935, David Clement Robertson 1841-1927 and Thaddaeus Robertson 1848-1851. 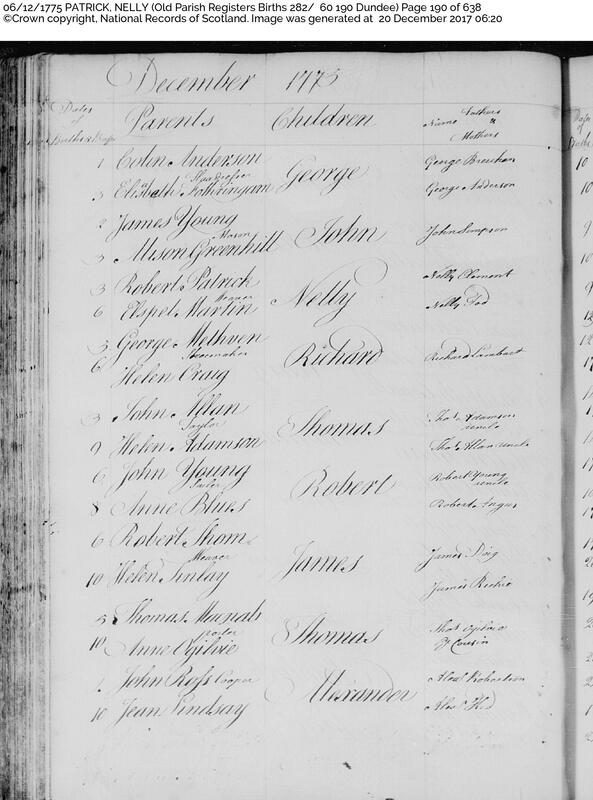 “Shaking Leaf” suggestions on Ancestry.com regarding a migration record for the Robertson family aboard the Lady Kennaway, departing Leith, the port of Edinburgh, Scotland on 19 April 1838 and arriving in Sydney on 11 August 1838. The birth of a daughter during the voyage, was one of the first records I collected concerning the Robertson family. The record was that of the surgeon, Dr Robert Waugh’s report, from on board the ship, noting that a Mrs Robert Robertson had given birth to a daughter. It was interesting that little baby Eliza Robertson was given the middle name Waugh in honour of the Lady Kennaway’s ship’s surgeon. This record listing the Robinson Family from Dundee was elusive. 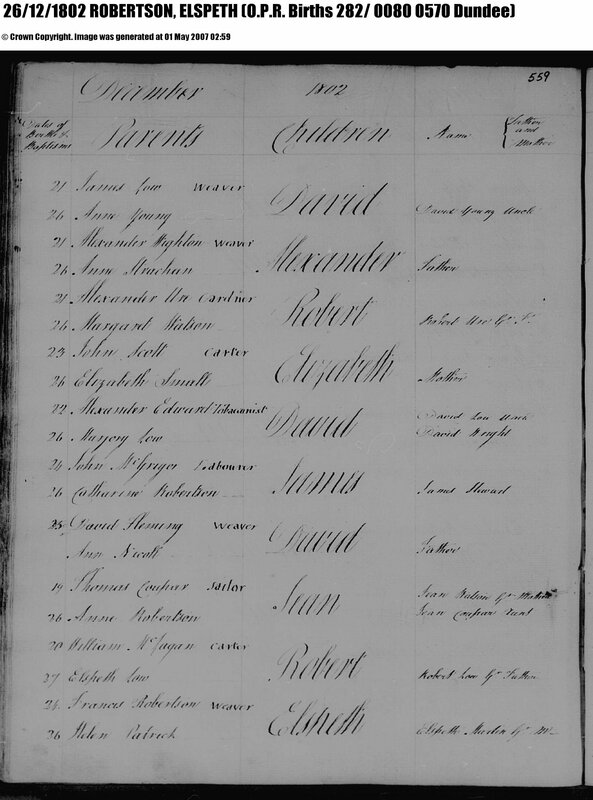 Robert Robinson 35, his wife Mrs 34, Anne, Janet, Elspeth, Elizabeth and William with Robert’s occupation listed as Garickman (possibly gardener), noting that he can read and write. The rest of the family, except William can all read. 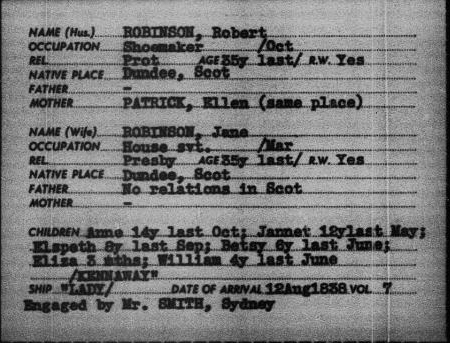 I didn’t find this record because the family were listed as Robinson and it was only later that I discovered the Robertsons all listed together as Robinson in the same document. 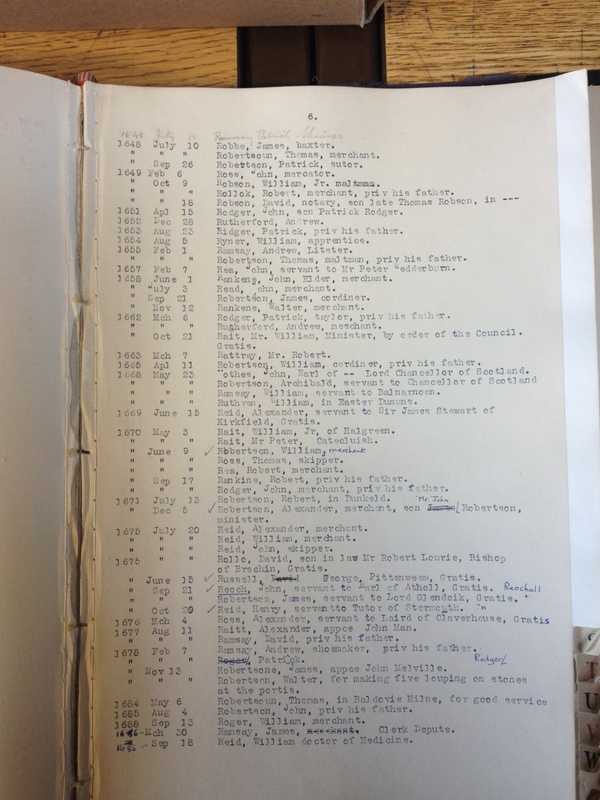 During a search for documents for Richard Kippax at the State Library of New South Wales I came across a Kippax Robertson Family Tree which had been lodged with the library from an anonymous donor. I was able to access the document and photograph it. It was about this time during my research that I came upon a Roots Web enquiry page for Robert Robertson dated 2002 and an email address for Lynne Clarke, a family researcher, who was a descendant of David Clement Robertson. It was one of those incredible moments in my family research when Lynne replied to my email and from that moment on Lynne and I became firm friends and new cousins. We have had an amazing time, firstly swapping documents and information and then meeting at the NSW State Library for some sleuthing. 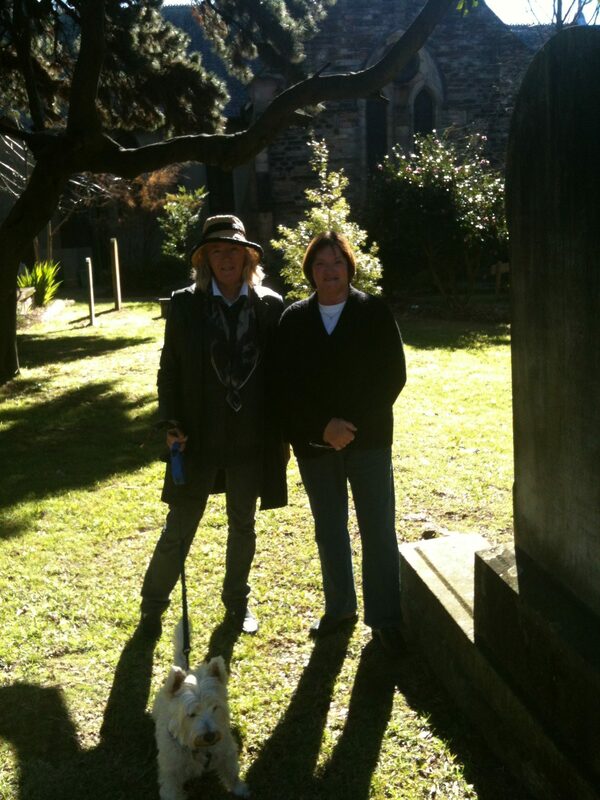 Then we joined expeditions to both Rookwood Cemetery and Ashfield Cemetery to discovered our ancestors together. We always took morning tea and that was when I discovered Lynne’s amazing ability cooking up biscuits and cakes. My sister Lavinia also joined in our expeditions and we all took a delight in uncovering our past. 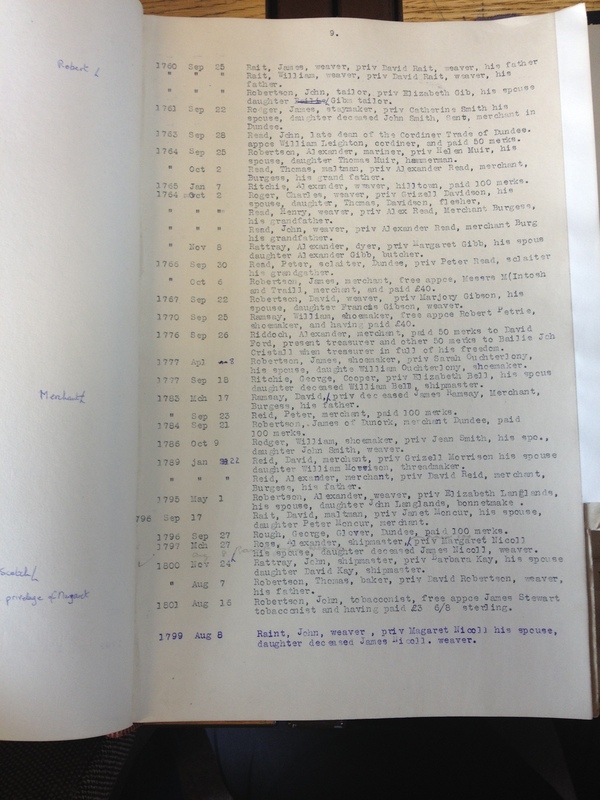 I should add that Lynne has been researching much longer than I have and her ability and the extent of her research was such that I was in awe that she had been able to take the family right back to Dundee and find records and family there that I never dreamed was possible. 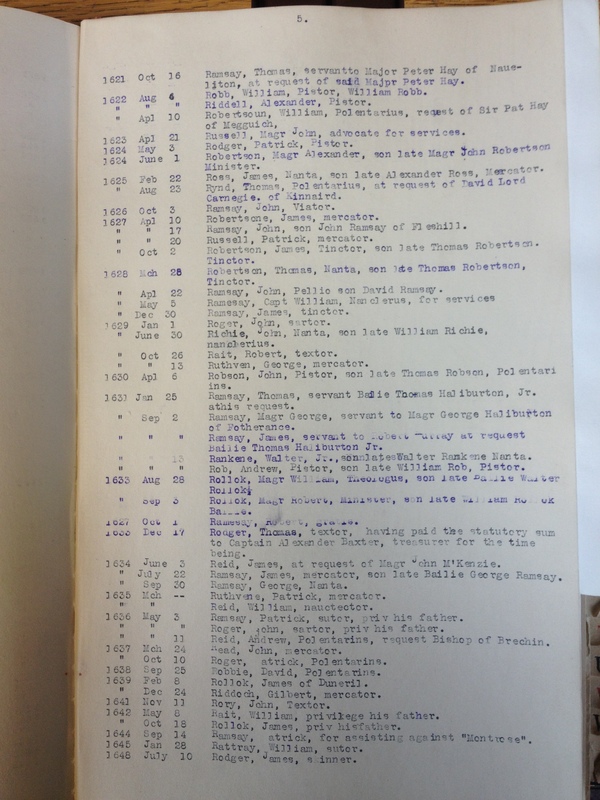 It was wonderful to have this document and to see that Lynne had also collected the Robinson record from Family Search. 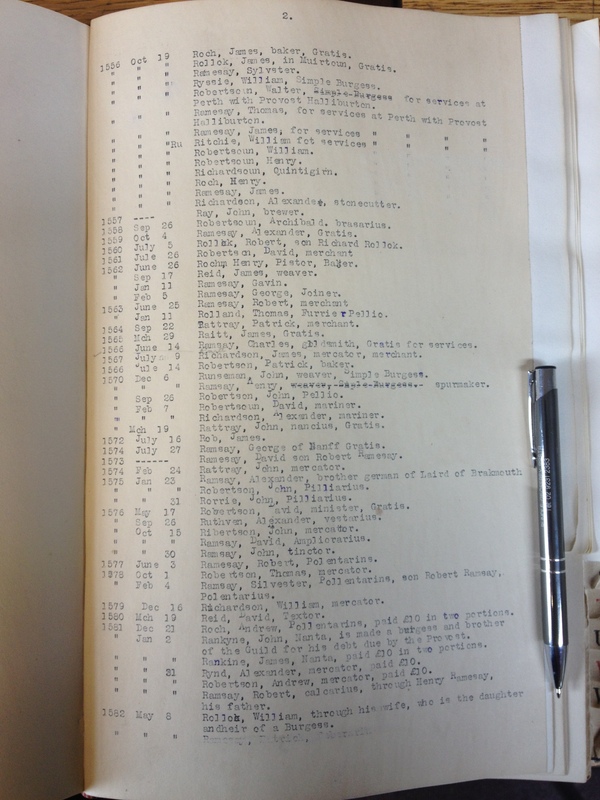 It contained so much information including the fact that on arrival he was already engaged by Mr Smith of Sydney. 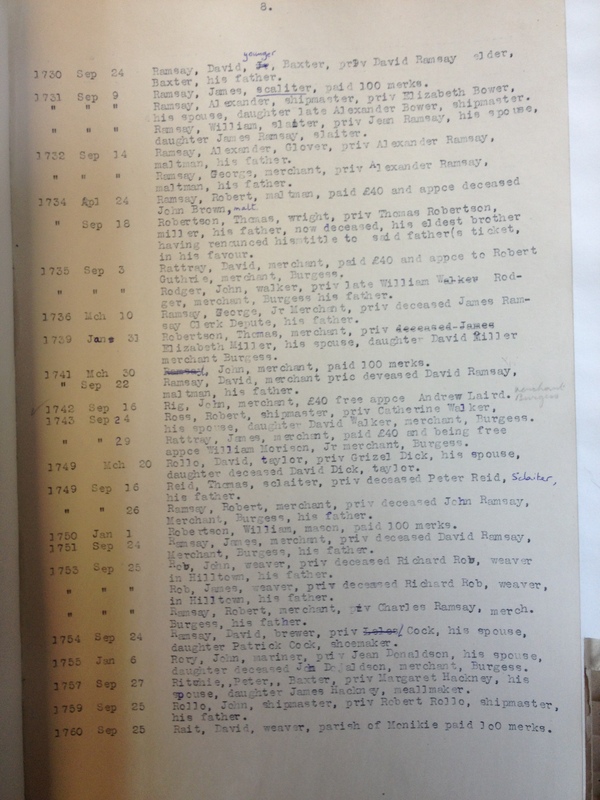 Another interesting piece of information from this document was the listing of Robert’s mother as Ellen Patrick. 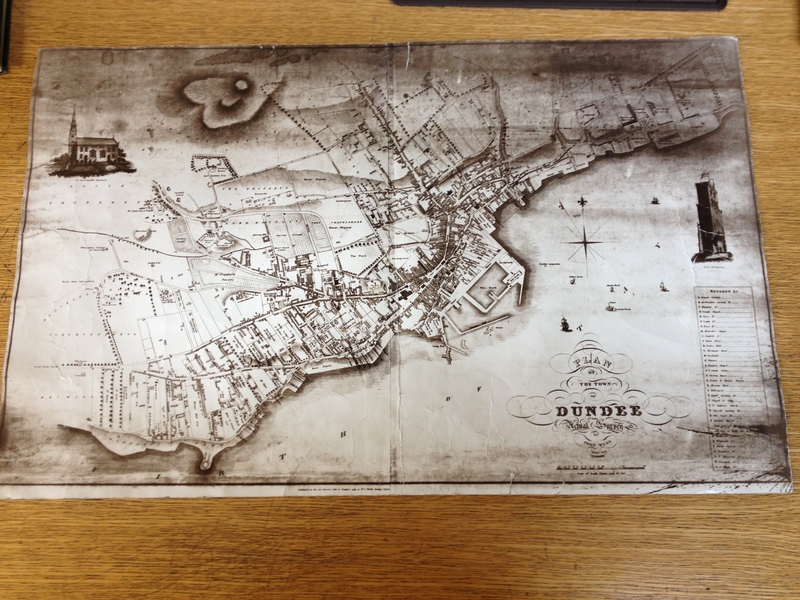 This was yet another important piece of information that would take my research back to Dundee in Scotland. The name Patrick was given to the Robertson’s young son, William Robertson and Ann Robertson as a middle name. 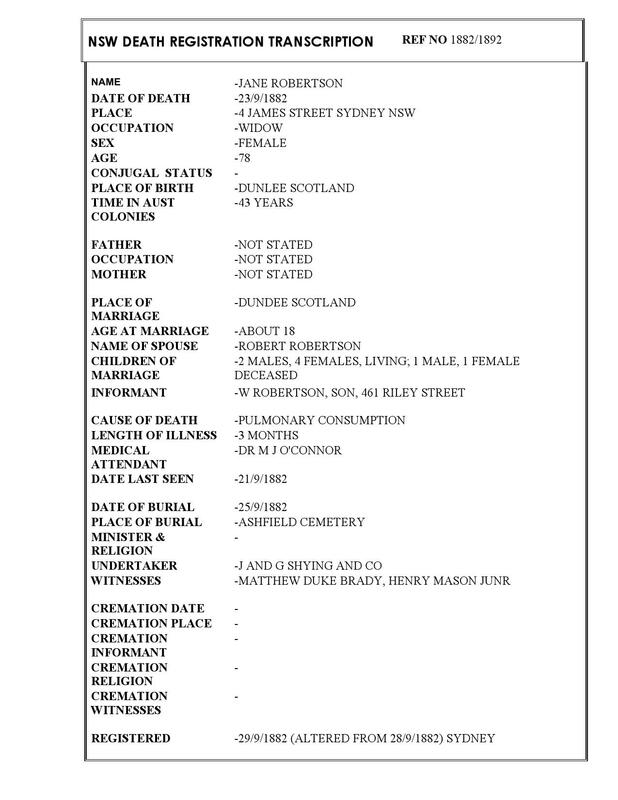 Jane Robertson lists herself with no relations back in Scotland, presumably that meant both her parents had already died. 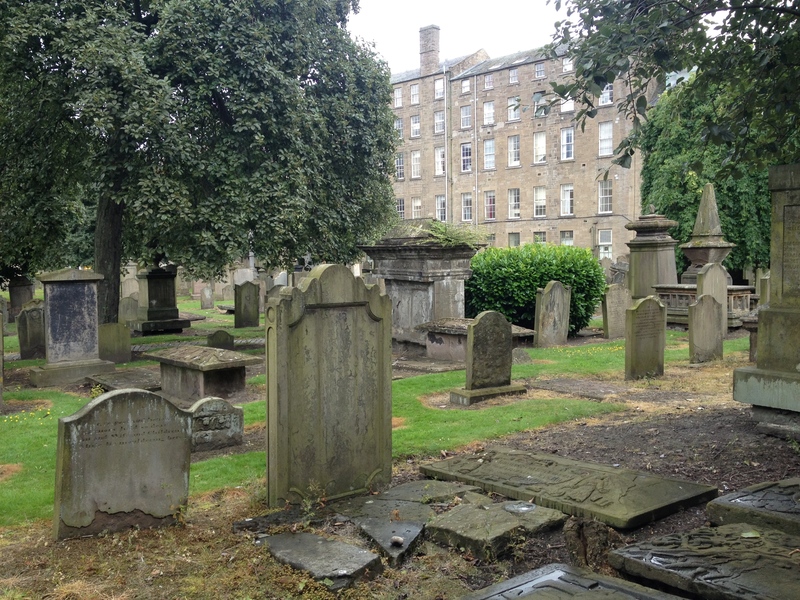 One of our first expeditions was to visit Ashfield Presbyterian Burial ground which is attached to the Church and gardens. It is a special and most beautiful area in the middle of the very dense suburb of Ashfield. 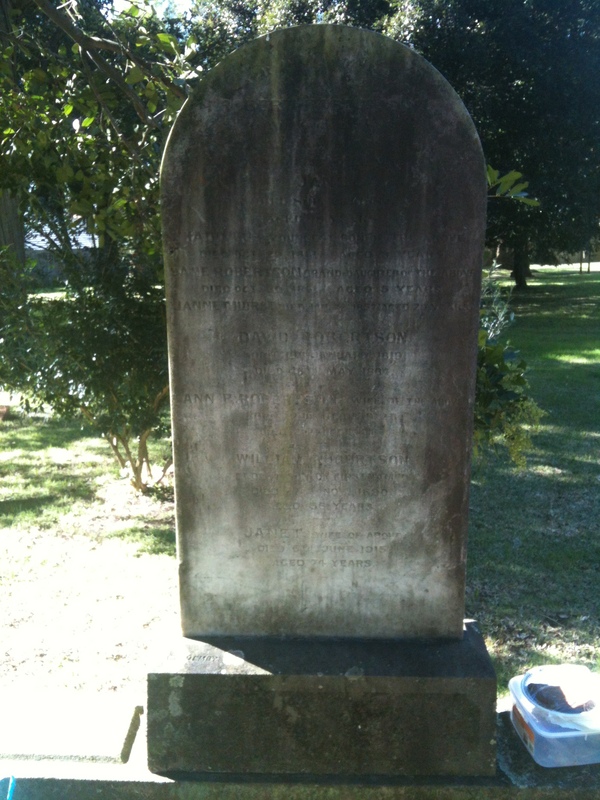 The Robertson Headstone is very large sandstone monument and unfortunately very badly worn by weather and time. It was lucky for us that Lynne had some great ideas and she suggested a rubbing of the grave to reveal more of the inscription. It was a brilliant idea and she came prepared with rubbing paper and charcoal for the task. The result was most impressive. It was incredible to see the inscriptions become readable with every line we rubbed with charcoal. Nine members of the Robertson Family were buried at Ashfield Cemetery. One could see by the engraving that it had been done over several decades. 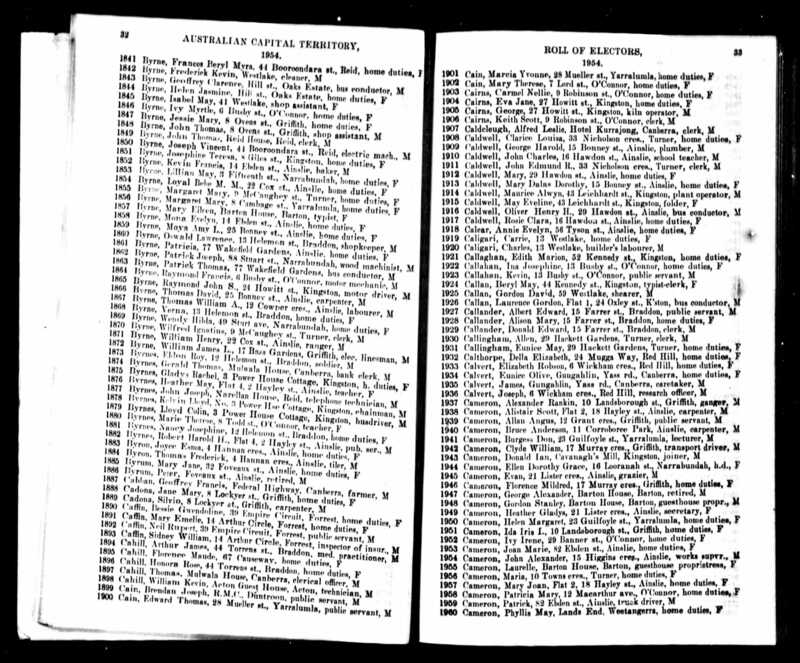 It is an amazing record of our early family settlers in the Colony of New South Wales. I stood in front of this beautiful headstone and thought about their bravery and courage to board a creaky ship and travel across the world to a newly colony and wondered why they made this momentous decision to migrate? 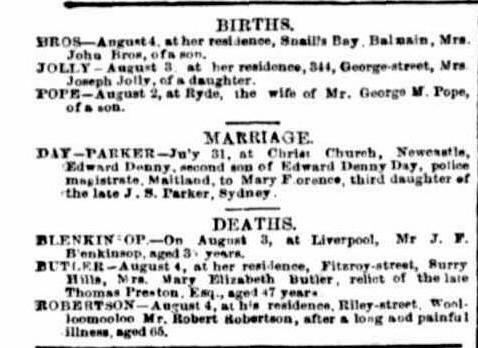 I also saw the tragedy of the Robertson’s youngest child, Thaddaeus, dying at only three years of age, and grand-daughter Jane, aged five, and wondered what had caused their deaths only a day apart in October 1851. 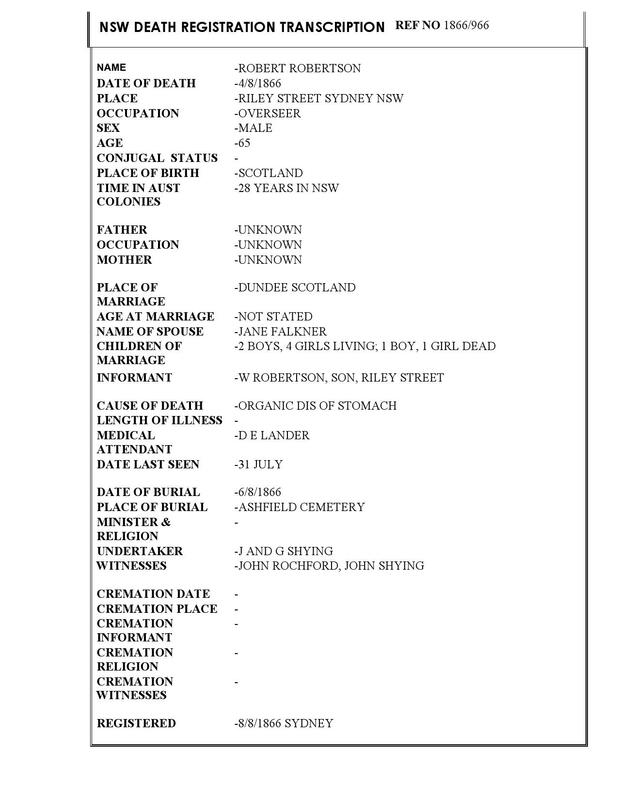 It was interesting to read the information on Robert’s death certificate and see his wife Jane’s maiden name listed as Falkner (sic) which was actually Falconer. Again, this new family name would be a help when taking the family history back to Dundee in Scotland. Two significant documents fell out of the Robson Bible that my sister Lavinia Chrystal has in her collection. One was the Murray Family Tree and the other was “The Betty Letter”, so called because it was only signed Betty and for quite some time I had no idea who Betty was. This letter gave rise to a family myth, and my training always taught me to beware of family stories, no matter how exciting they may sound. My research has found absolutely no information about a family “Earl”. 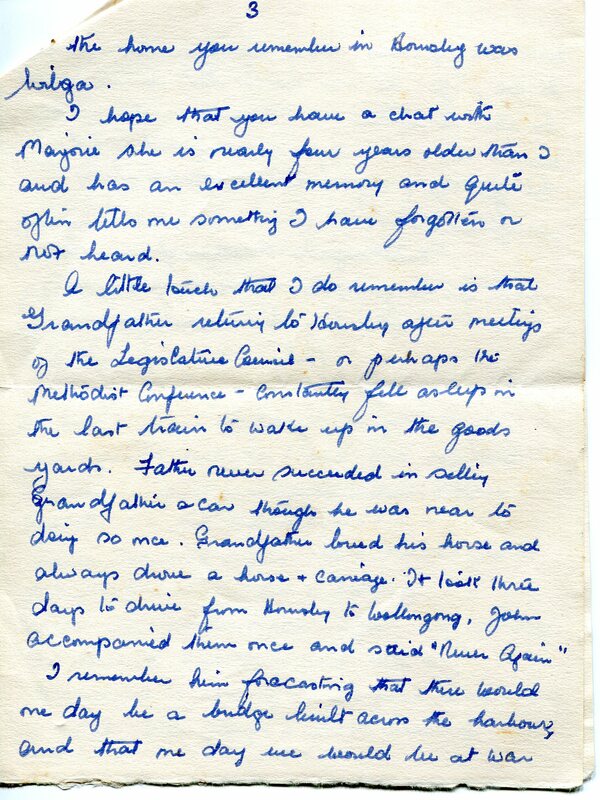 Dad had also looked back at this letter and written 1967? Betty was absolutely correct, two Kippax brothers did marry two Robertson sisters, William Henry Kippax married Elizabeth Whitton Robertson and his brother Samuel Kippax married Eliza Waugh Robertson who was born on the Lady Kennaway. Betty also knew that a brother to Elizabeth and Eliza was David Clement Robertson, who indeed did have three wives, Mary Ann Armstrong, Ada Mona Bellenger and Matilda Upton, with children born from each marriage. Otto Robertson was the son of David and Matilda Robertson. 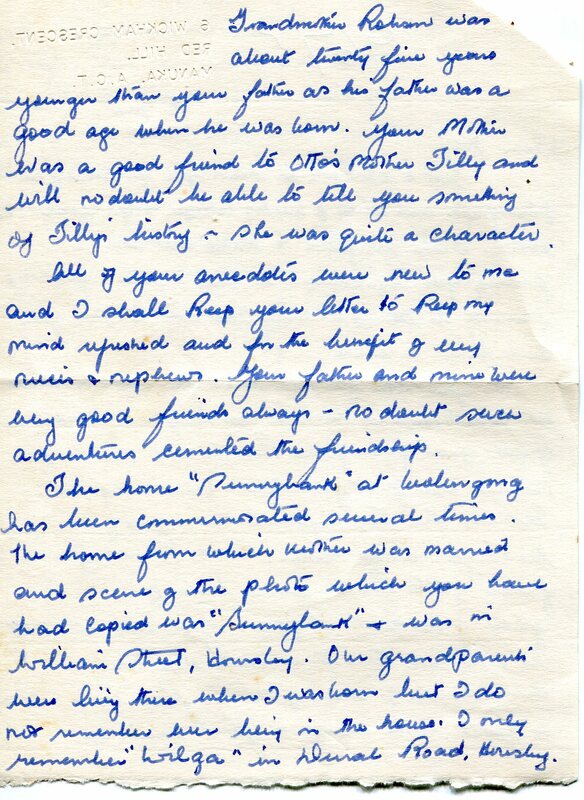 Oh, how I wished I had a copy of my father, Reg’s letter to Betty and learn about those “anecdotes” he knew about. A clue to Betty was her father and dad’s father were good friends and it would seem that their adventures were the stories she referred to as those “anecdotes”. There is so much information in this letter and the references to Sunnybank being the Robson home at Wollongong and then Dural. 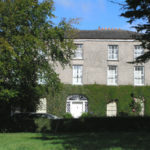 This gave me clues that this was the home of William Robson M.L.C and his wife Annie Robertson and that Betty and Dad shared a set of grandparents which meant they were first cousins. Marjorie was Betty’s sister, so now I was able to place them as possibly the daughters of Ethel Kippax Robson, dad’s aunt and sister to his father the Hon. W.E.V. Robson M.L.A. and late M.L.C. Betty was also referring to Larke Hoskins and her father trying to sell a car to William Robson M.L.C. but never succeeding. “John” must be John Short Larke, so Betty must be related to Ethel Robson and probably a daughter. However, not having any knowledge about them, I was hastily trying to place them into my ancestry.com Rundle Family Tree. Birth, death and marriage documents available on ancestry have time limitations of 50 to 100 years and I would have to resort to A.C.T. Electoral Rolls to find these cousins. 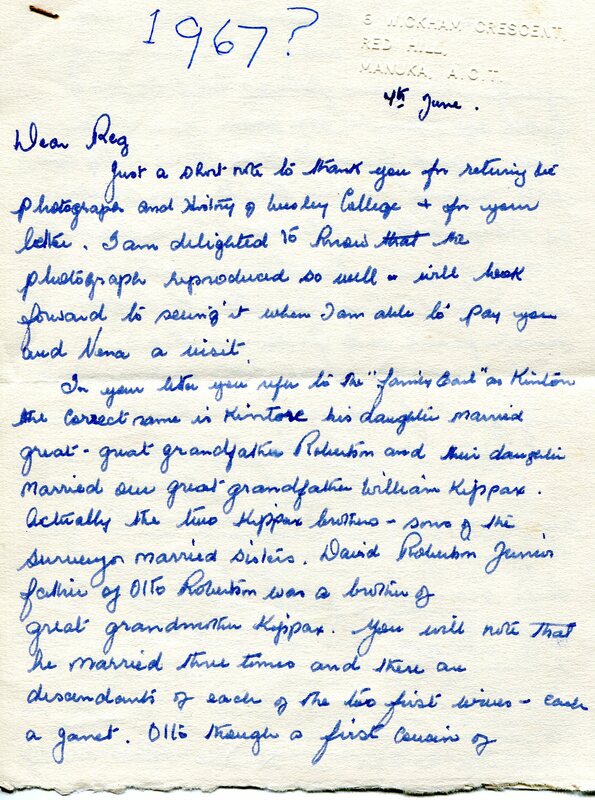 It was a wonderful letter from Betty and as I scanned it into my computer files I also shared it with Lynne Clarke knowing that the mentioning of the Robertson was as interesting to me as it would be to her. Indeed, Otto Robertson was Lynne’s great uncle. Lynne’s line comes down from David Clement Robertson’s first marriage to Mary Ann Armstrong, her great grandfather, her grandfather was Sydney Jackson Robertson and her father was Sydney Clement Robertson. The interesting name Clement appears to be a family name, coming from Dundee. Now I was ready to discover who Betty was and it took a fair amount of detective work to find her in Red Hill in Canberra. She was listed as Elizabeth Robson Calvert nee Larke, the daughter of Ethel Kippax Larke nee Robson, dad’s aunt and a sister to W.E.V Robson. As I had hoped, an A.C.T. Electoral Roll held the clue to the identity of Betty in “The Betty letter”! 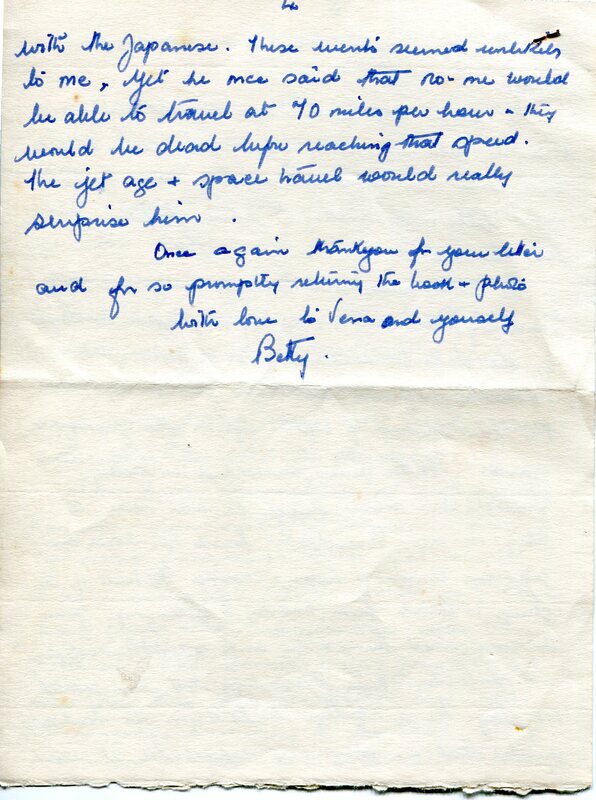 This document mirrored the address on “The Betty Letter”. It was wonderful to be able to identify Betty and place her into our family tree, as well as her sister Marjorie. 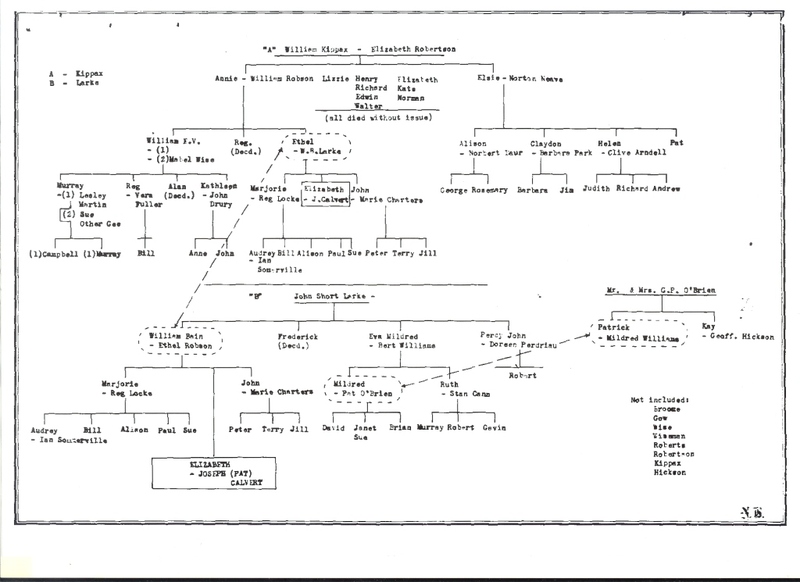 I also concentrated on enlarging these other Robertson lines in the family tree. 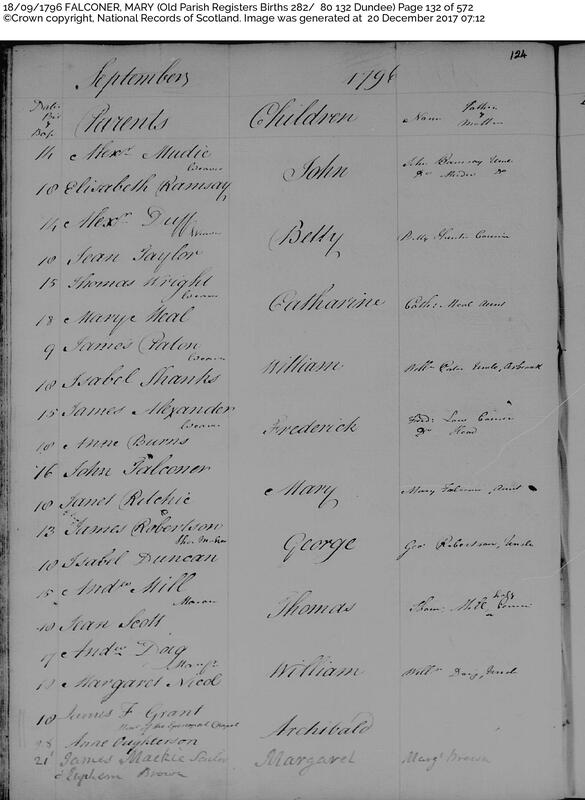 I then accepted the Birth Index for David Clement Robertson’s son Sydney J Robertson, a record I had hesitated to collect because of a wrongly transcribed initial “L” in his father’s name. Sydney had entered the Royal Navy in 1910 as a stoker on board the Challenger, after the Navy he became a mechanic, married Ann Betts and they had a son Sydney Clement Robertson, the father of Lynne Clarke. Otto Robertson was the son of David Clement Robertson and his third wife Matilda Upton. He died in 1970 at Lindfield in Sydney and I wondered if dad had attended his funeral as he obviously had known him. 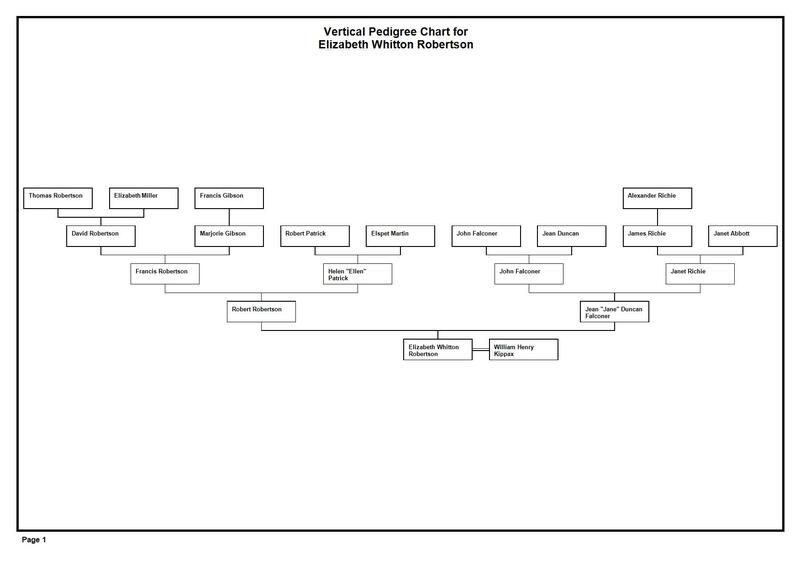 This vertical pedigree chart for Elizabeth Whitton Robertson, my Great-great-grandmother, should help Robertson descendants place our ancestors into the family tree. The important thing to note is four distinct Scottish branches, the Robertson and Patrick lines and the Falconer and Ritchie lines. Ancestry.com also does a Five Generation Pedigree Chart and I produced on for Elizabeth Whitton Robertson and another for my father Reginald “Reg” George Robson and together they illustrate eight generations of family ancestry. Geoff and I were planning a trip to Scotland in 2013 to celebrate Geoff’s 60th. We both had quite a few family branches from Scotland. For Geoff, it was his paternal grandmother’s Lindsay Clan from Montrose in Scotland and the Kidd family of Fifeshire. For me, it was the Robertson Family of Dundee, and the Moar Family of The Shetland Islands. We made great plan preparing in advance for our ancestry trail to Scotland. We travelled firstly to Edinburgh where we stayed in Princes Street, and the view from the sitting and dining rooms of our accommodation was amazing. Towering above us was Edinburgh Castle, perched above a mighty cliff top and below, spread out in the valley were the most beautiful gardens, all in bloom. As part of Geoff’s birthday celebrations our sons, Jeremy and Rowan, had purchased tickets to the Edinburgh Tattoo which, for Geoff and me, was a highlight. We were delighted also that Edinburgh was turning on superb weather for our visit. Another important date in Edinburgh was a visit to the National Archives called Scotland’s People, who were conveniently situated in an old sandstone building at 2 Princes Street. There is always a lot of red tape enrolling and gaining a reader’s card and this had to be done before we could take up our 2-hour booking of two computers for the morning. This did not come cheaply and we both had to work hard to obtain as many images as we could, dividing our time between our families. We also had an appointment at midday with a very kind researcher who met us in a viewing room to take us through some original Kidd documents, which involved even more red tape and other documentation. Online purchase of documents is possible but expensive as a per document fee of several pounds makes one cautious about obtaining incorrect records. 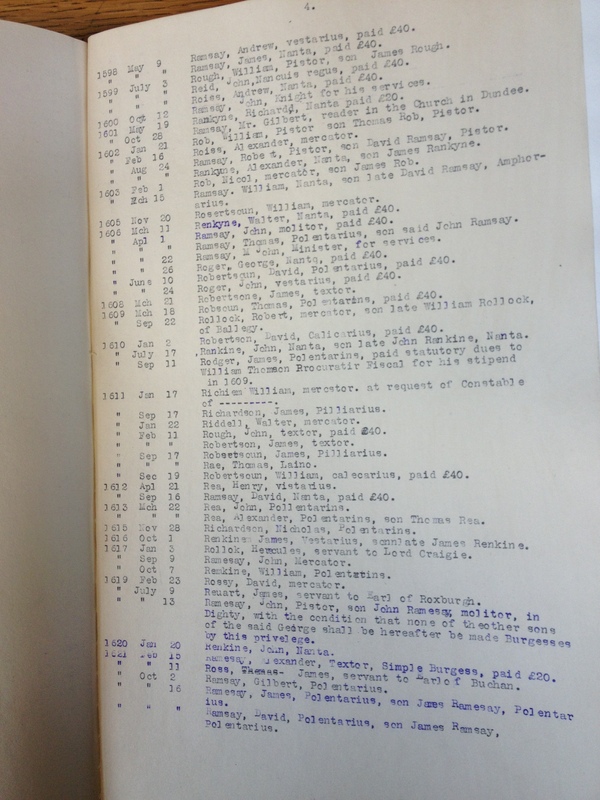 It was wonderful to be able to scroll through their parish records and capture the correct records. 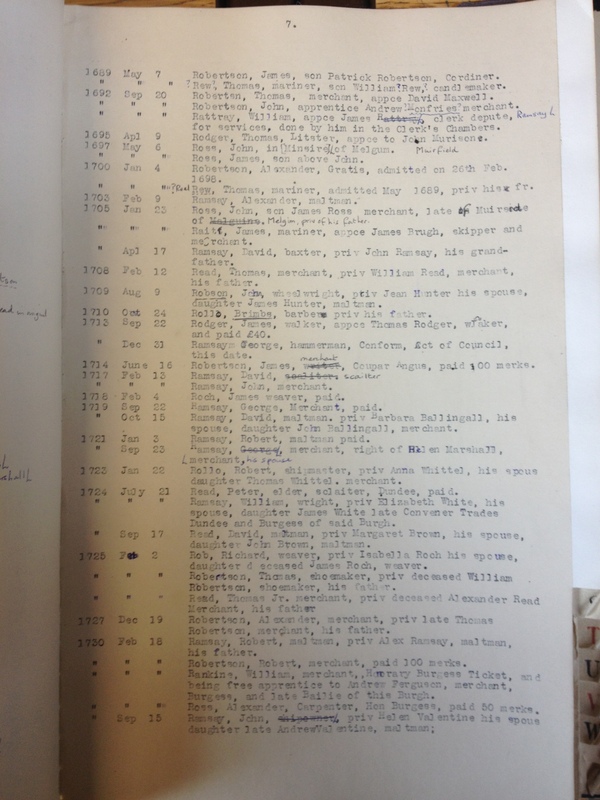 Thanks to the collaborative work I had done with Lynne Clarke I was armed with a long list of original records to obtain, with names, dates and parishes ready to get down to work. Lynne and I had obtained from several sources many transcriptions of the records we needed, online resources such as Family Search, Ancestry.com and Find My Past have a treasure trove of records, however Lynne and I would only be satisfied with original documents. 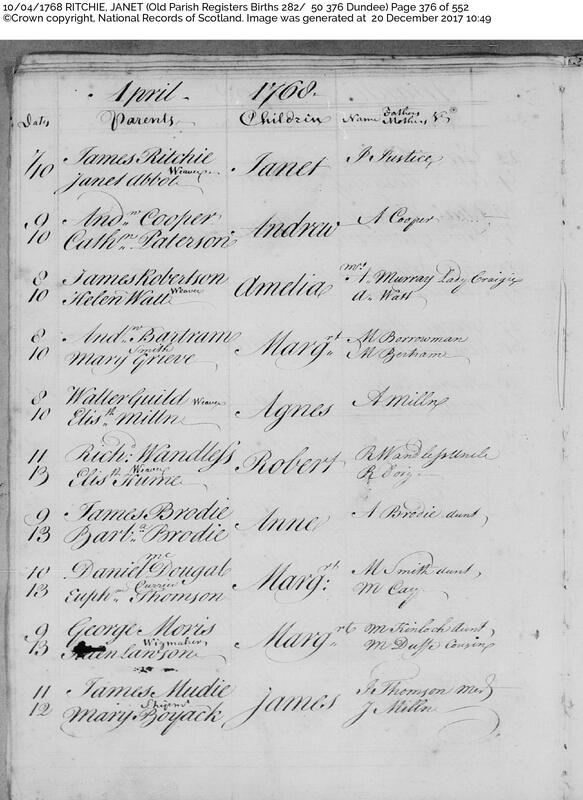 Marriage of Robert Robertson, shoemaker, and Jean, daughter of the late John Falconer, Flax dresser, 12 August 1822 Creich, Fife, second from bottom listing. Image from Scotland’s People. 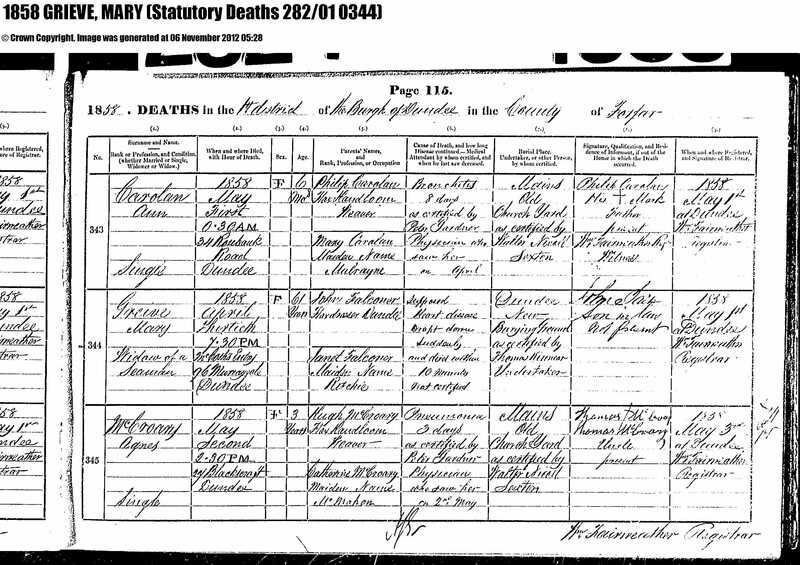 Baptism of Elizabeth Whitton Robertson daughter of Robert Robertson, mill overseer and Jean Falconer 15 July 1832, born 24 June 1832, Parish of Dundee. Image from Scotland’s People. Baptism of Elspeth Petrie Robertson daughter of Robert Robertson, mill overseer and Jean Falconer 4 October 1829, born 26 September 1829, Parish of Dundee. Image from Scotland’s People. 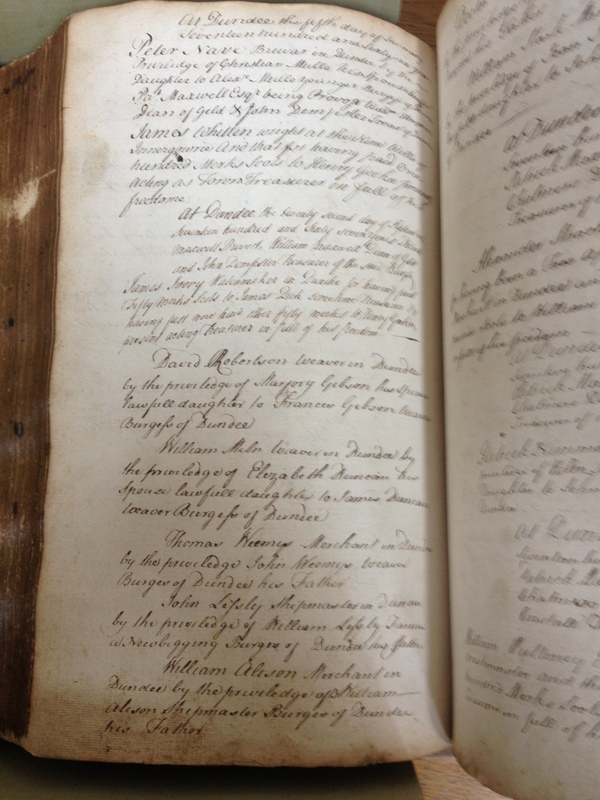 Baptism of Robert Robertson, son of Francis Robertson and Helen Patrick, sponsored by Robert Patrick, 12 Oct 1800, born 8 Oct 1800. No occupation was listed for Francis. Image from Scotland’s People. See image at bottom of page. 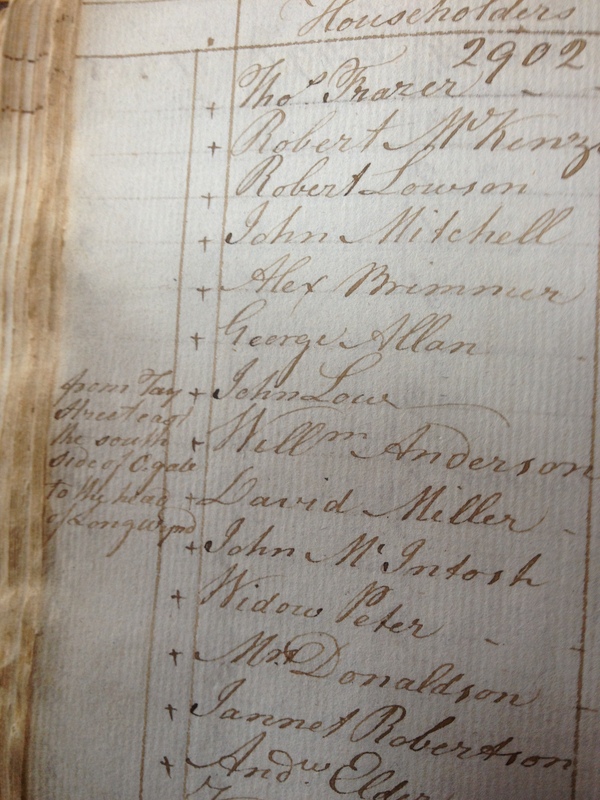 Baptism of Anne Robertson, Robert’s sister, 5 November 1805, Dundee Parish Records, image kindly supplied by Lynne Clarke. 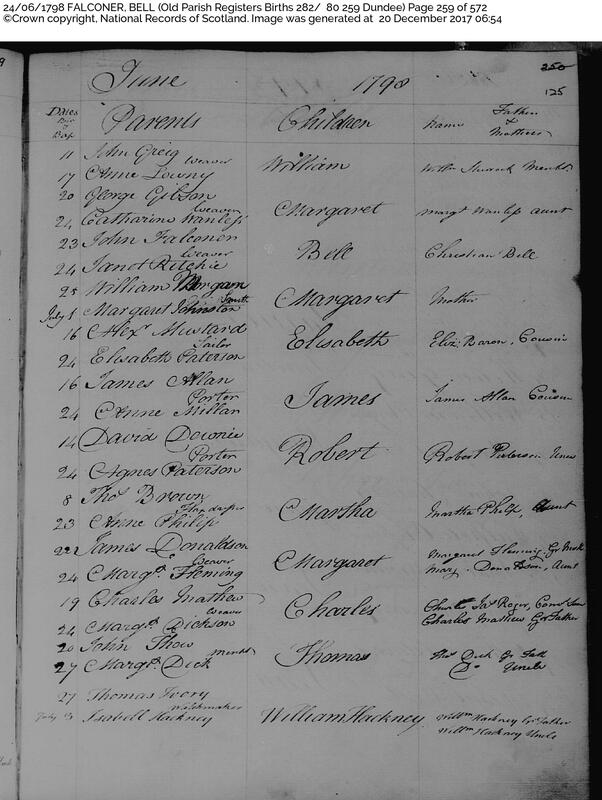 Anne’s baptism entry is second from bottom and interestingly, Francis’s occupation is listed as a soldier in the Forfar Militia. 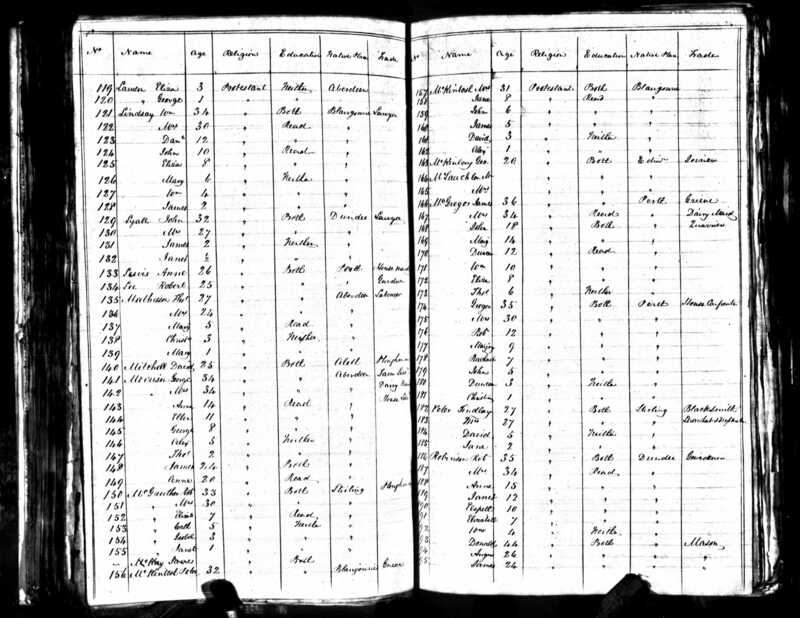 Baptism of Elspeth Robertson daughter of Francis Robertson, weaver, and Helen Patrick 26 December 1802, born 24 December 1802, Dundee Parish Records. The sponsor for the baptism is Elspeth Martin, grandmother. Elspeth Martin was married to Robert Patrick, the maternal grand-parents. It was delightful to see the naming of the child after the sponsor, following the Scottish tradition of naming the first born female child is named after the maternal grandmother. Record kindly supplied by Lynne Clarke. Elspeth was a sister to Robert and Ann Robertson whose baptisms were previously shown. 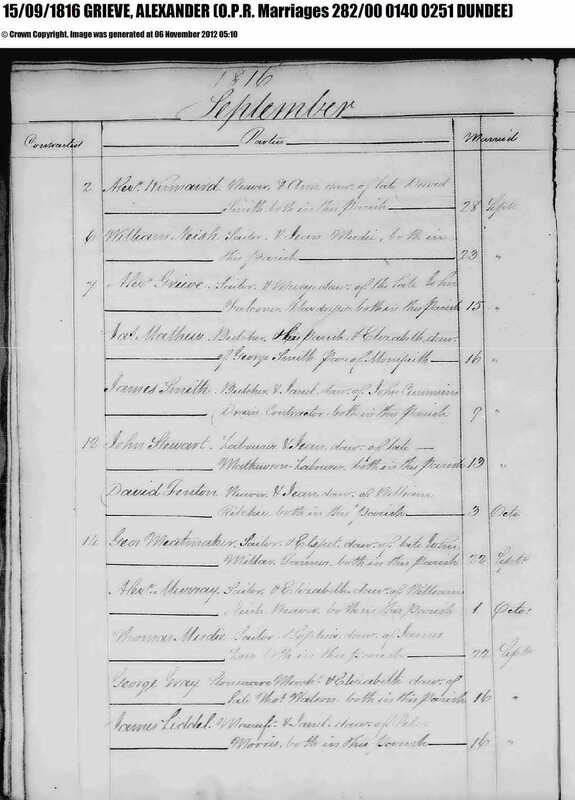 Marriage of Francis Robertson, weaver, and Helen Patrick, parish of Creich, 3 August 1799. Record from Scotland’s People. 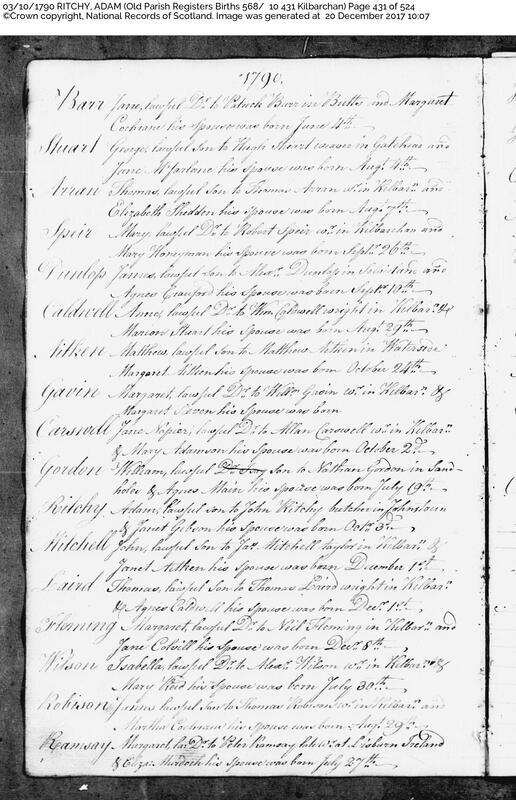 Baptism of Francis Robertson, son of David Robertson, weaver, and Marjory Gibson, 16 August 1742, born 15 August 1742, sponsors were Francis Gibson, Marjory’s father and Francis Martin. Record from Scotland’s People. 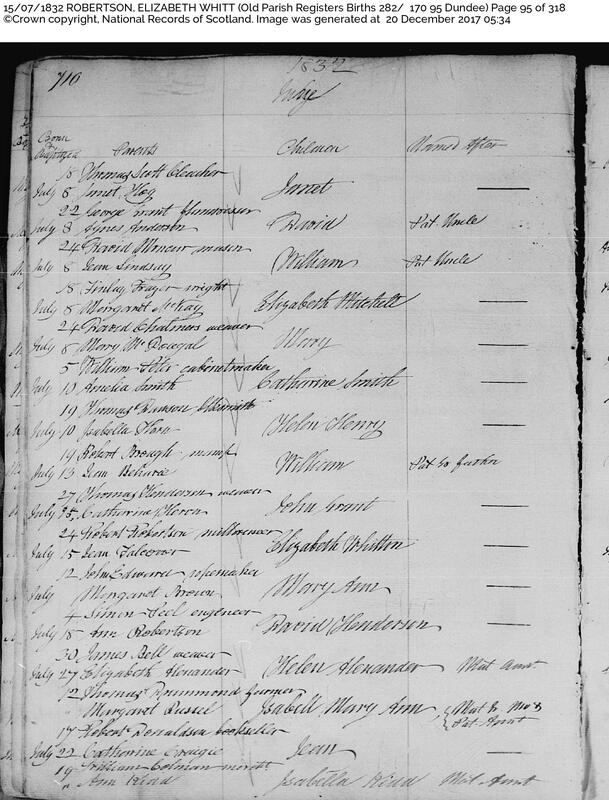 Baptism of Nelly “Helen” Patrick daughter of Robert Patrick, weaver, and Elspeth Martin, 6 December 1775, born 3 December 1775, Parish of Dundee. Sponsors were Nelly Clement and Nelly Tod. Image from Scotland’s People. 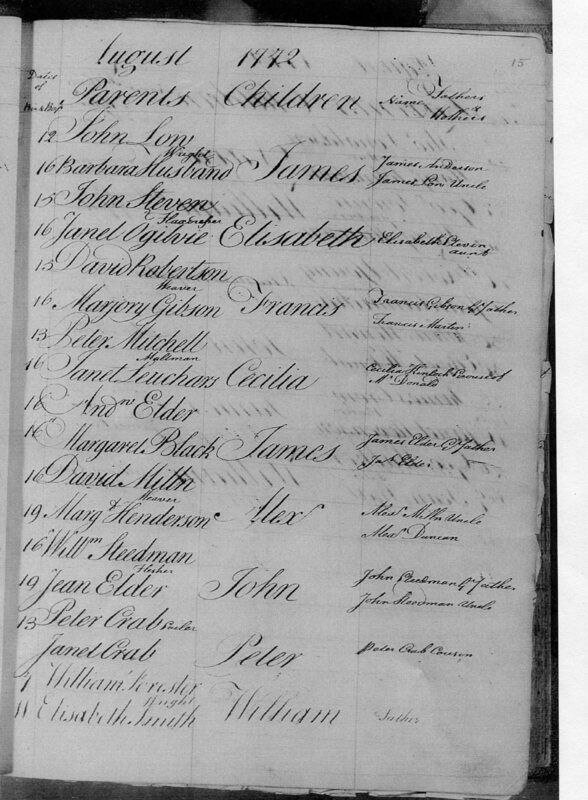 Marriage of Robert Patrick and Elspeth Martin, 22 November 1774, Dundee, parents of Nelly Patrick. Image from Scotland’s People. The next few records come from the Falconer side of the family. 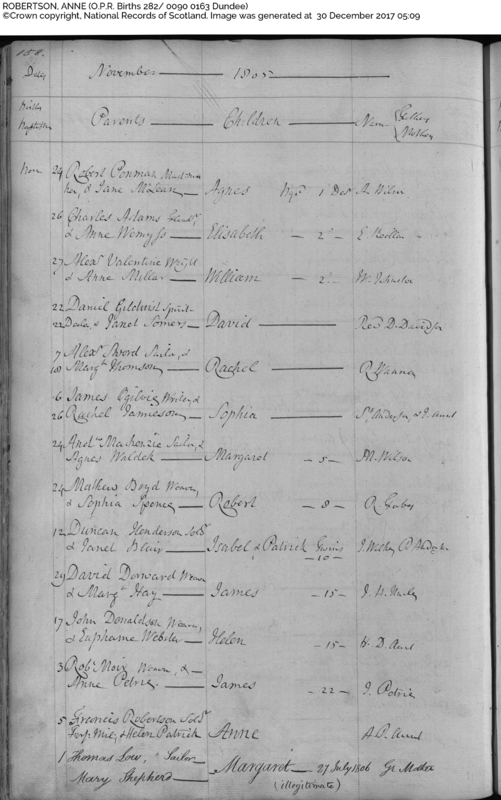 Baptism of Jean Duncan Falconer daughter of John Falconer and Janet Ritchie, 20 March 1803, Parish of Dundee. Sponsor was Jean Duncan, paternal grandmother, mother of John Falconer. Image from Scotland’s People. Scottish naming traditions dictate that a second/third born daughter is named after the paternal grandmother. Jean Duncan Falconer married Robert Robertson, and they are my 3rd great grandparents. 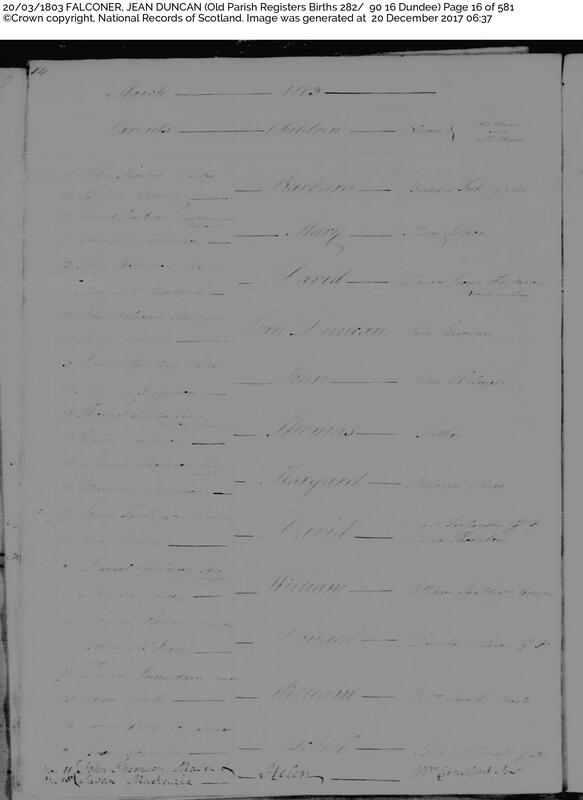 Baptism of Joan Falconer, daughter of John Falconer, flax dresser and Janet Ritchie, 6 January 1805, born 1 January 1805. Sponsor was John Low. Joan was a sister of Jean “Jane” Falconer my 3rd Great grand-mother. Record from Scotland’s People. 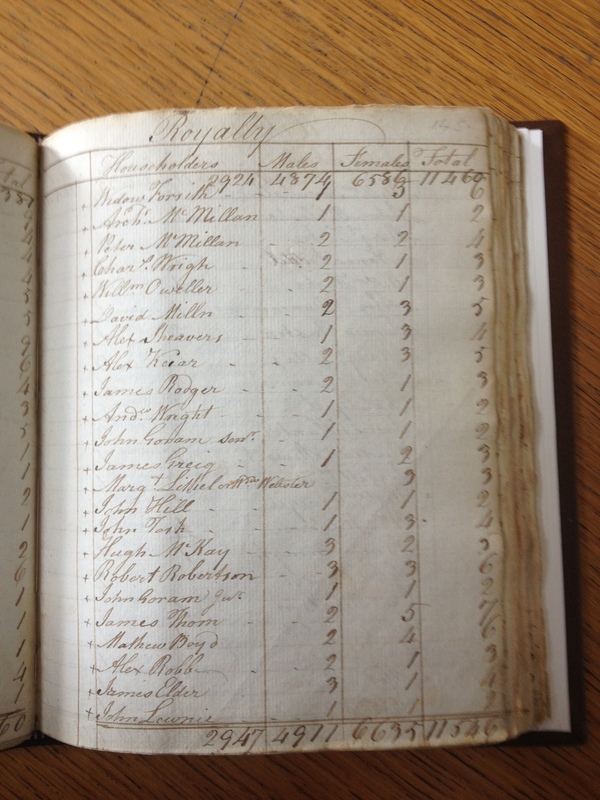 Baptism of Bell Falconer, daughter of John Falconer, weaver, and Janet Ritchie, 24 June 1790, Dundee, born 23 June 1790. Sponsor for the baptism was Christian Bell. Image from Scotland’s People. Baptism of Mary Falconer daughter of John Falconer and Janet Ritchie, 18 September 1796, born 16 September 1796. Sponsor at the birth was Mary Falconer, aunt. Image from Scotland’s People. Marriage of Alex. Grieve, tailor, and Mary, daughter of the late John Falconer, 15 September 1816, Dundee. 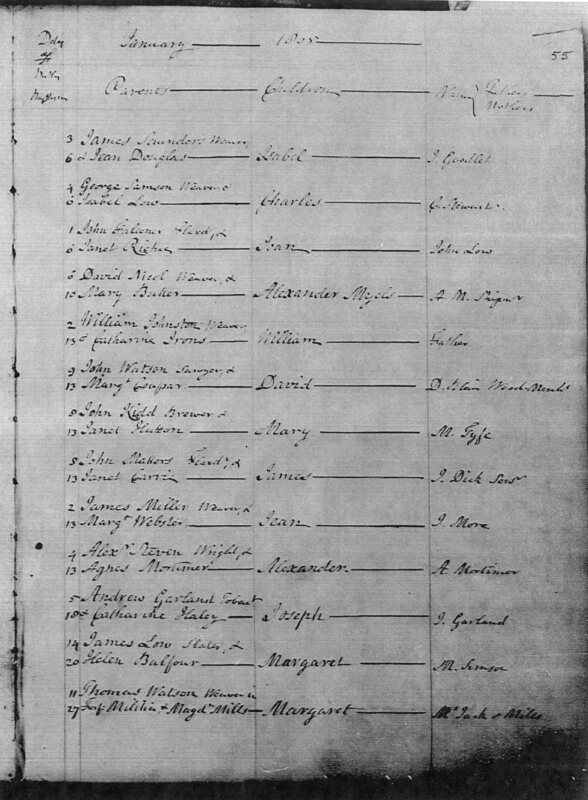 Image courtesy of Lynda Tait Ancestry.com Family Tree. It was wonderful to see another family researcher collecting records for the Falconer ancestry and I was also to obtain from the same ancestry.com tree Mary Grieve’s death record with gave so much information. 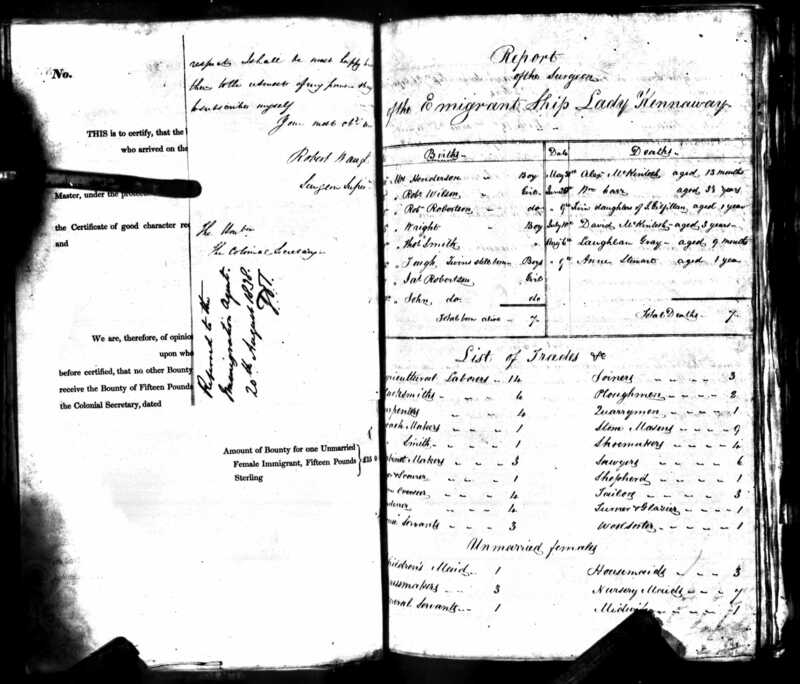 Death Record of Mary Grieve, widow of a seaman, 13 April 1858 at 7.30pm. Lynda Tait Ancestry.com Tree. 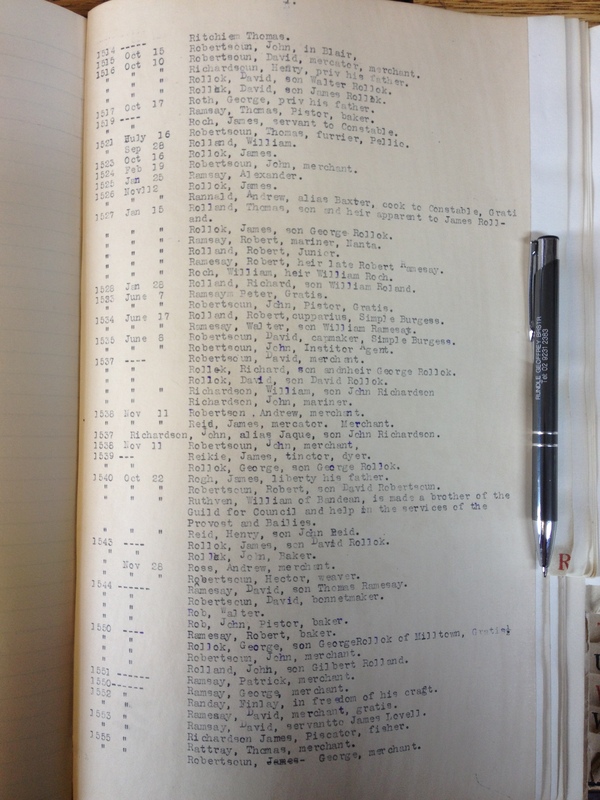 This record lists details about Mary’s father John Falconer, flaxdresser of Dundee and her mother Janet Falconer, maiden name Ritchie. This was wonderful supporting mirroring information that gave me comfort that I had collected the correct records. 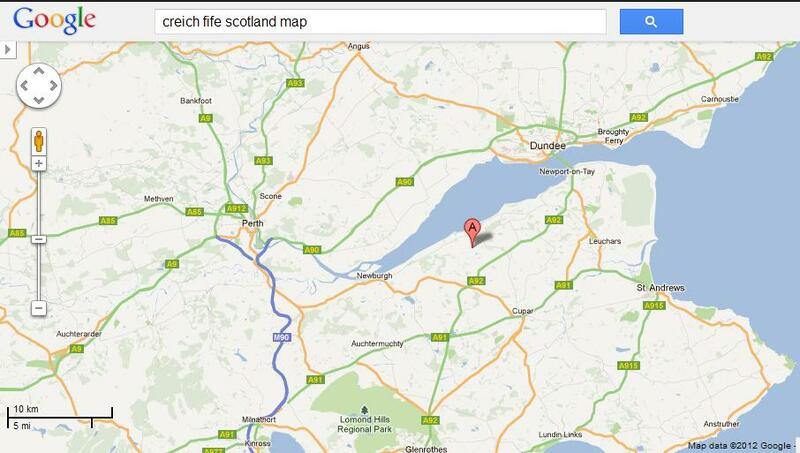 Map of Scotland showing Creich (A), Dundee and Perth. Today there is a huge bridge crossing from Dundee to Newport-on-Tay, however, distances in the Scottish Lowlands are not far to travel at time before the railroads went through Scotland in the first half of the 19th Century. The Patrick family came from Creich. Baptism of Janet Ritchie daughter of James Ritchie, weaver, and Janet Abbott, 10 April 1768, Dundee, born 7 April 1768. Baptism sponsored by J. Justice. Janet Ritchie wife of John Falconer. Image, Scotland’s People. John Falconer and Janet Ritchie’s children Jean, Mary, Bell and Joan Falconer appeared in previous images. 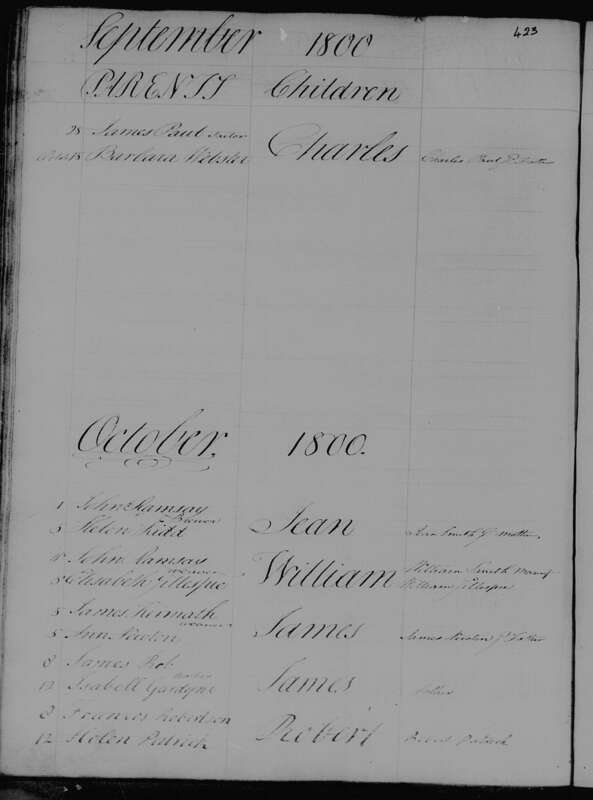 Marriage of James Ritchie and Janet Abbott, 9 June 1758, Dundee. Image from Scotland’s People. Just when I thought I was finished with my Ritchie research, I received an email from James Edgar, an astronomer from Canada, that was quite out of the blue. 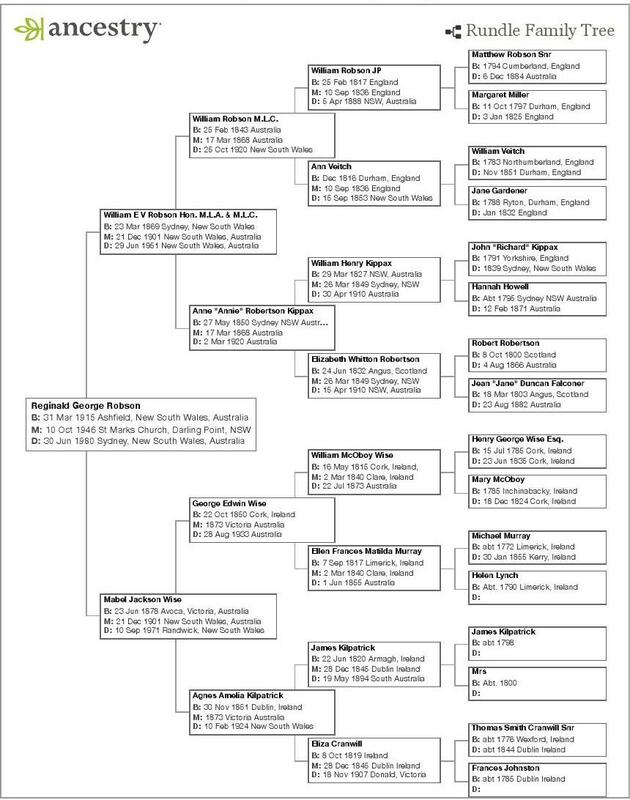 I had undertaken a FTDNA test back in 2012 as part of the Kilpatrick Project, to try to determine my paternal grandmother Mabel Wise’s Irish ancestors. The wonderful part about this was that my DNA information remained listed on the website for others to make a connection. 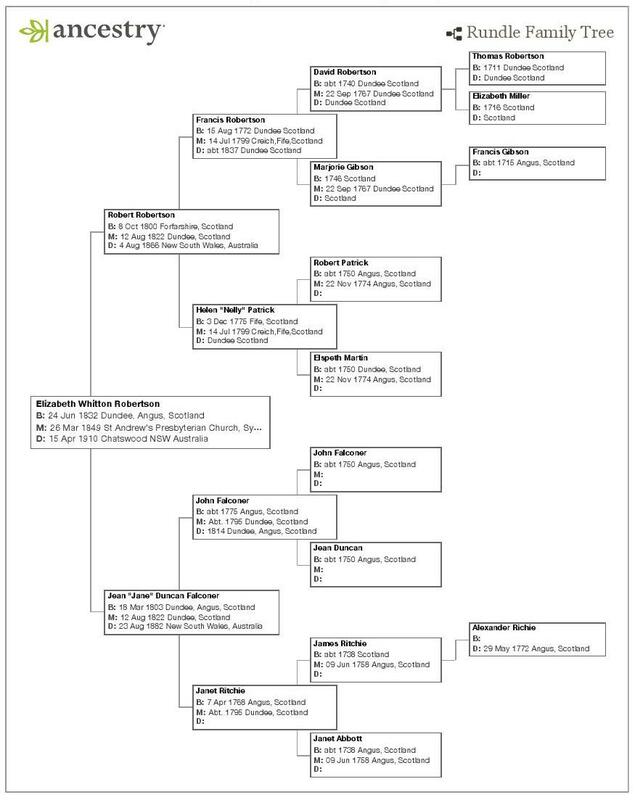 My recent FTDNA Family Finder results show you as a 4th cousin. Maybe we can find a connection. How nice to hear from you. Thanks for your family tree attachment. I had a good look about and confirm that our line is probably the Ritchie family. First cousins, five times removed. This DNA collaboration actually works! This is my fourth DNA connection, and the second for Scotland. Indeed, I have Ritchie ancestors from Dundee and surrounds, including letters written by my father to his cousins when they were all trying to research the Scottish connection back in the 1970’s. Nothing prevailed from this and now we all have DNA and internet connections! I had a quick look at my ancestry tree. I can invite you to see it, if you would like this access? Do let me know as I believe this would be free to you. I have now placed your ancestor Adam Ritchie into the family tree and am hoping it is correct, but will rely on you to confirm this connection. Adam’s father John “Richie” Ritchie had a sister Janet, who married John Falconer – this is my descendant line. Their daughter Jean married Robert Robertson, and they migrated aboard the “Lady Kennaway” in 1838 to Australia, settling in Sydney with their large family. 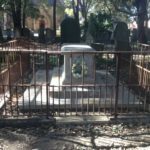 Their grave survives in an old churchyard in Ashfield, Sydney. Our family still lives in Sydney after all these years. There are several researchers here in Sydney who are interested in this line, and will be excited about your connection. Most particularly because of our cousin connection to an Australian Prime Minister, John Howard. 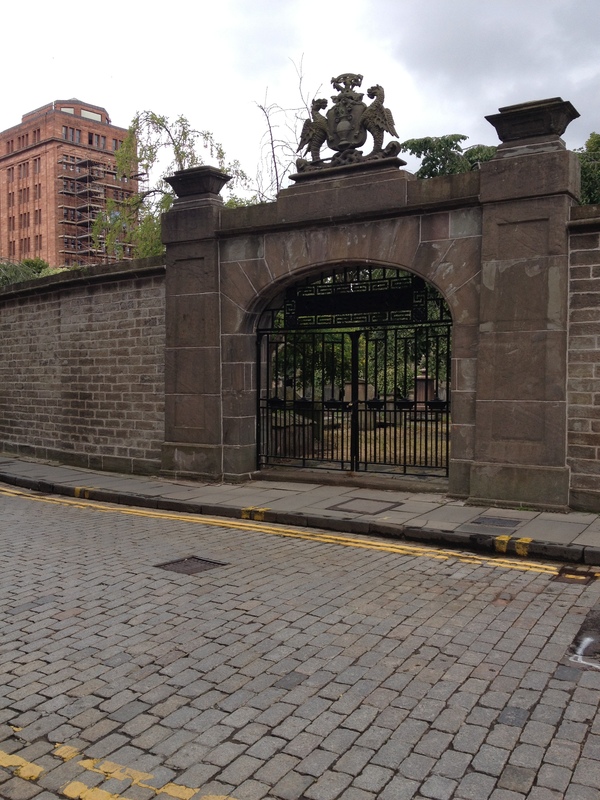 My husband and I travelled to Scotland in 2013 and we did some research in Edinburgh at “Scotland’s People”. I believe this record below may belong to your ancestor Adam Ritchie / Ritchy. Spelling mistakes are common. I also have Adam’s father John’s baptism. He was baptised on the same day that his parents James Ritchie and Janet Abbott were married! So that is interesting news… I have all these records and have placed them into my ancestry.com tree. I have often wondered about your line. 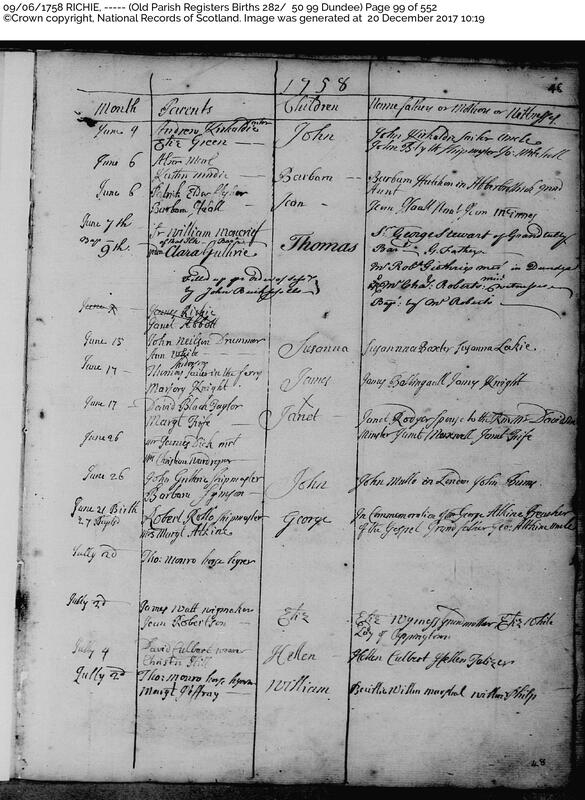 Baptism of Richie, son of James Richie and Janet Abbott, 9 June 1758, Dundee. Image, Scotland’s People. When I obtained this image, it threw up more questions than it answered. For a start it was incomplete and then it looks as if an attempt has been made to cross it out. 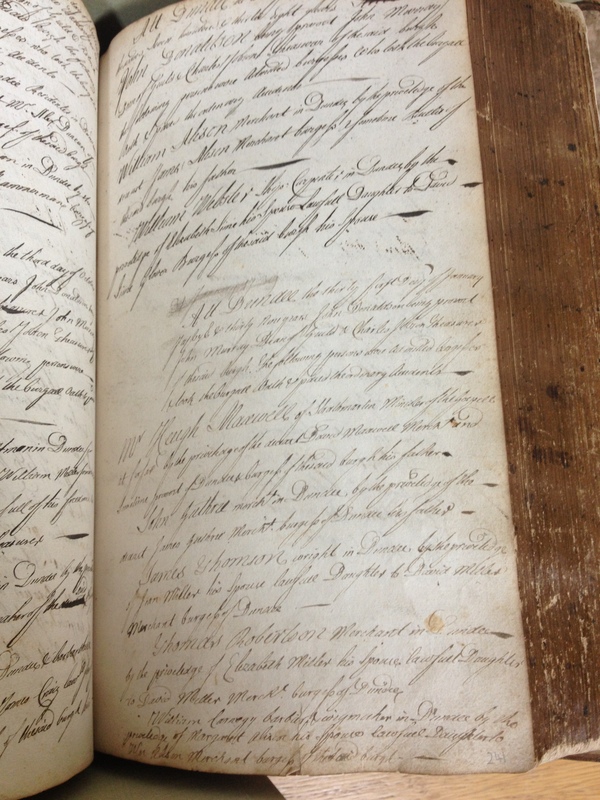 Did the vicar start writing the couple down in the wrong parish record book, a birth rather than a marriage? It was certainly odd, and so is the marriage entry which does not give a date for the marriage, only a contract date. 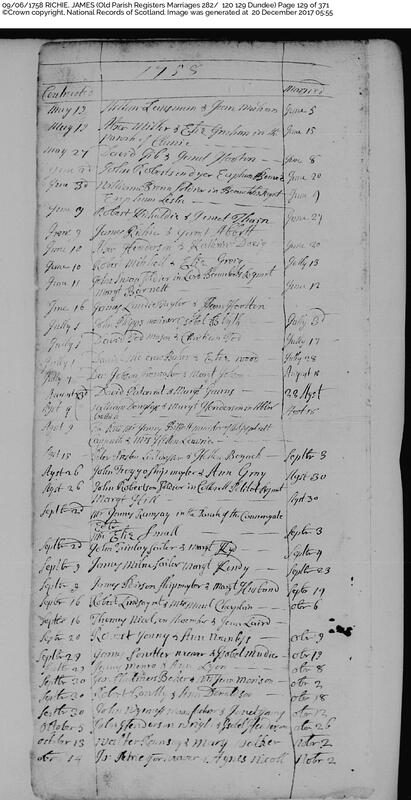 Baptism of Adam Ritchy (sic), son of John Ritchy and Janet Gibson, 3 October 1790, Kilbarchan. Image from Scotland’s People. Kilbarchan is west of Glasgow. I have linked Adam Ritchy and his descendants to my Ancestry.com Rundle Family Tree, pretty confident that this is his Ritchy line. There is one definite, the DNA works, and James and I are definitely distant 4th cousins. James Edgar is an enthusiastic member of Facebook and he quickly found me, my sister and my niece, asking whether it was my sister or my niece who was the Olympic Skier? He puts up many photos of interest about astronomy, more recently he was following the eclipse of the sun across North America. 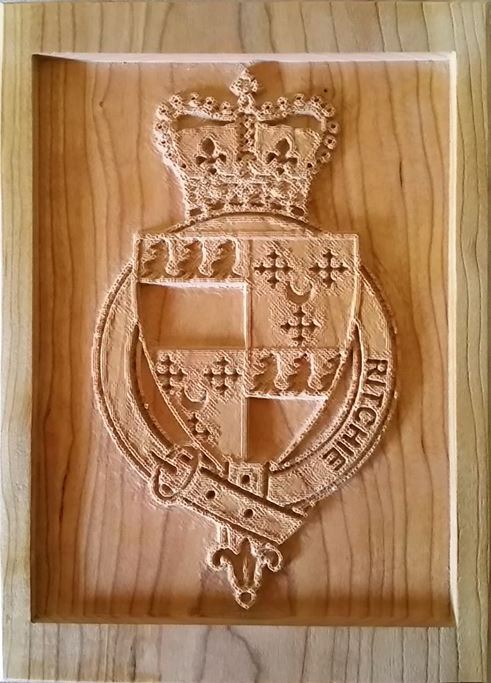 He is also a talented carpenter in his spare time, and it was delightful when James provided the family with the Ritchie crest, which I have placed on my Facebook of the Dead, which is my nick name for ancestry.com! One of the most exciting days of our holiday was spent in Dundee. 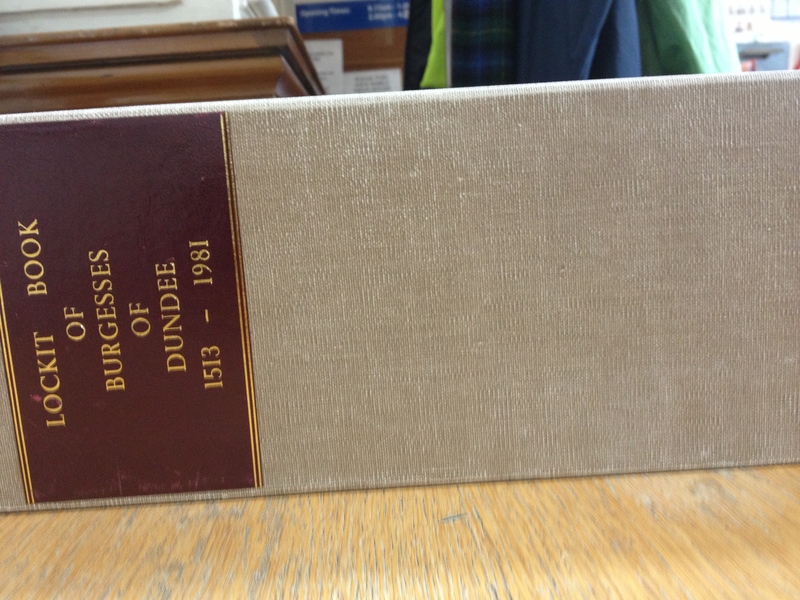 We had primarily gone there to inspect The Burgess Register of Dundee, frequently called The Dundee Lockit Book, so named because two men with separate keys had to be present together to open the book to enter a new name on the roll. This was a book concerning the skilled merchants of Dundee, today we would term this enterprise a “Closed Shop” however, it was a clever way of preventing the oversupply of traders and merchants in the city. To be eligible to be placed on the roll, you had to be either the son of a merchant, or marry the daughter of a merchant. This sensibly limited over supply of merchants, and gave the city an elite status, both to the men and sometimes women, included on the roll, and to the city, and its flourishing business affairs. 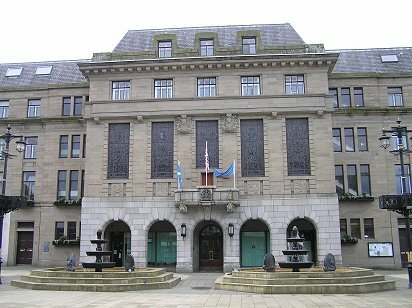 Entry to the book, gave status and many advantages, one of which was entry into the city cemetery, The Howff, which is famously the very centre block of the city, just opposite the Town Hall, where The Dundee Lockit Book is stored. I had emailed from Sydney to explain the reason for my visit to the Town Hall, and I received no reply. I checked the access and ascertained that we would have to visit on a week-day. We turned up at about 10am and we were met with little enthusiasm at the Reception who had no knowledge of the Lockit Book’s existence. I decided just ask directions to their archives, and this was certainly a most interesting adventure. Geoff and I were free to walk about the building, and we wended our way down into the bowels of the building, and finally knocked on an old glass door, where we were greeted very pleasantly by two members of staff. They were so kind, and it was just a magical experience when one of the staff offered to go and get the book for us to look at. 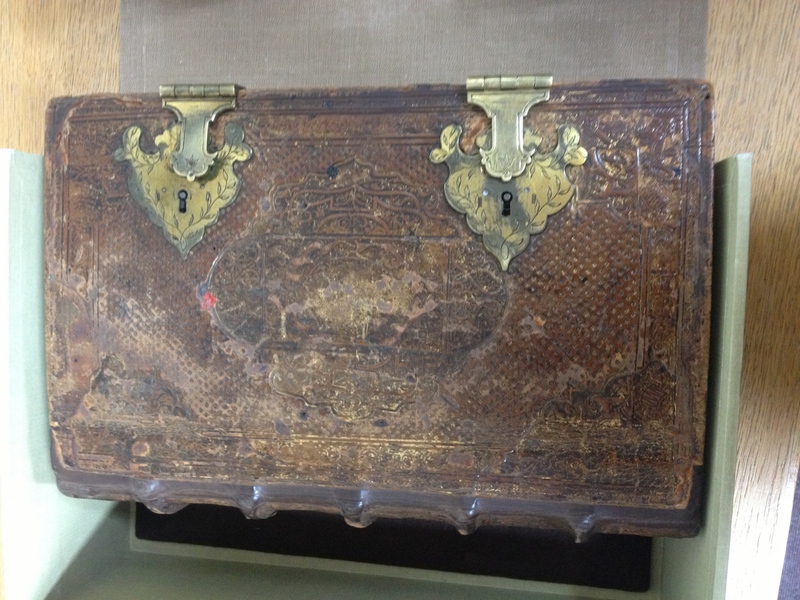 It was just amazing experience to watch as the box was opened, the two keys were then used to open the large locks on, and then we were free to open it and look at several pages from this ancient book. One of the staff then made an interesting comment. He told us that in all his thirty years, he had yet to meet anyone who could find their ancestor within the pages of The Dundee Lockit Book. 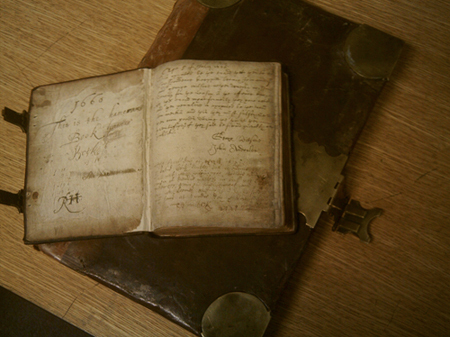 Well, he may have underestimated me, quite rightly, as inexperienced, but no-one could underestimate the ability of Lynne Clarke, who had studied the online transcriptions of The Dundee Lockit Book, and had given me strict instructions, and a wish list of Robertson ancestors to look up, and on which page I would find them! I do have to admit that after Lynne shared with me the online link, I too, was absorbed for hours checking the transcriptions and making notes for my impending visit. I wish I was given longer to look in this ancient book. It was amazing to have this beautiful relic in front of me, and, understanding that we were limited to view just a few precious pages. Within a few minutes, I had turned to a page, and found one of my ancestors. At this point the two staff members became more enthusiastic, and one was quite delightfully explaining to me that my ancestors were definitely buried across the road in the Howff Cemetery. However, again he schooled my enthusiasm by explaining that headstones would be a rare find, and every century or so, the cemetery had been razed to rehouse a new generation of merchant’s burials. This church is where so many of my ancestors were baptised, married and buried. We were so lucky to be there on such a magnificently warm and sunny day. The little penguins are a major tourist attraction. 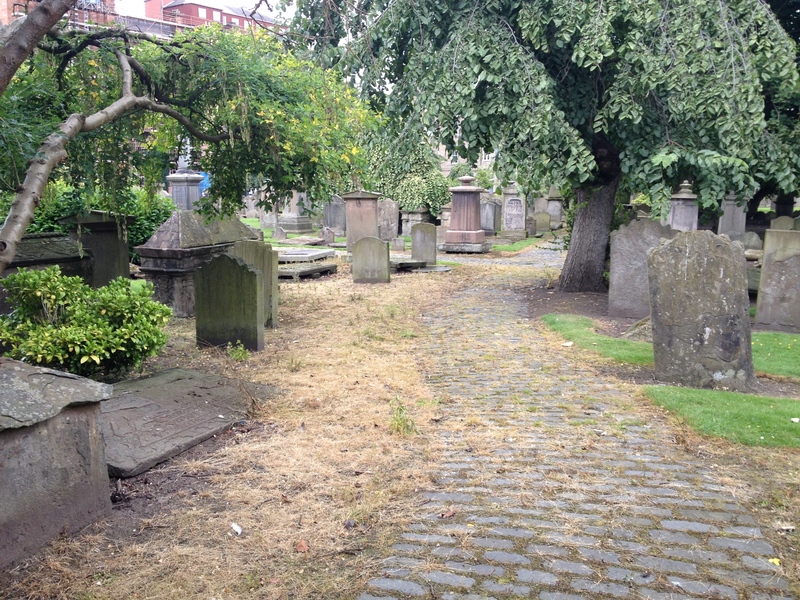 The Howff is a burial ground in the city of Dundee, Scotland. Established in 1564, it has one of the most important collections of tombstones in Scotland and is protected as a category A listed building. 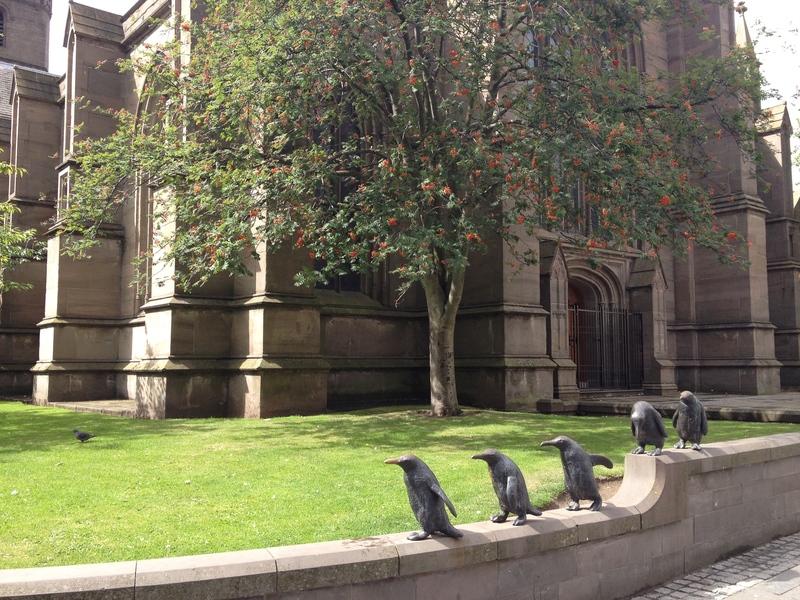 The cemetery takes up an entire city block almost opposite the Town Hall and nearby to St Mary’s Church. 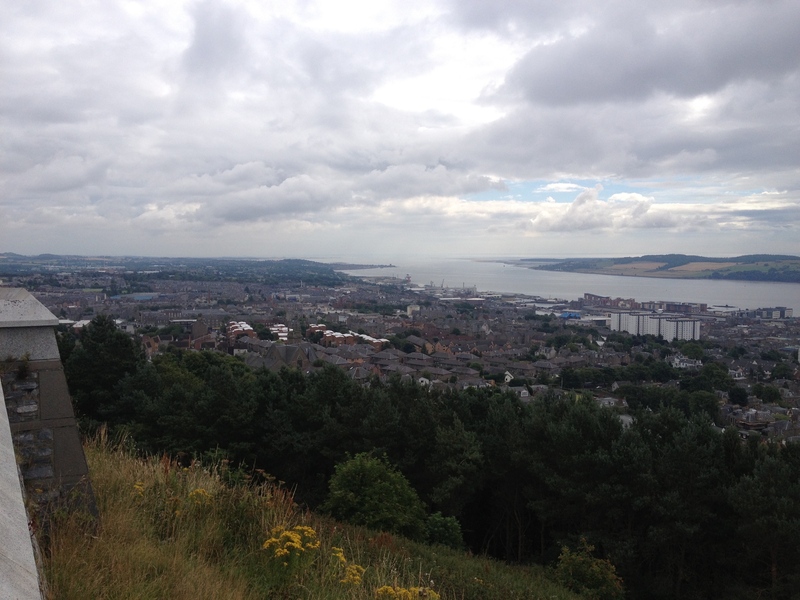 View of the River Tay, overlooking Dundee City from “The Dundee Law”, looking towards the sea. The site is apparently the plug of an extinct volcano, and the hill stands out from the city as a major landmark. For now, this is where I end this chapter on The Robertson Family of Dundee. I would like to dedicate this chapter to Lynne Clarke nee Robertson, as without her intrepid research, I would have had great trouble taking the Robertson family back to Dundee, and place them into their correct family. I am thankful that Lynne wrote a thread into Rootsweb.com back in 2002 and that she kept her email address “live”, while waiting for a response from a fellow family researcher on the world wide web. The incredible fun of my research, the absolute awe of my ancestor’s place in the world, and the excitement of opening each and every record to find out a new fact about our past has been so enlightening. However, the discovery of a “new” cousin and friend in Lynne Clarke is the best bonus of my research to date and discovering we share such a bond with our thirst for family research and knowledge is so wonderful. I know both Betty Calvert and my dad Reg Robson, would be so thrilled to think that we are continuing their quest to find out more about our past. You never know, maybe, if we can go back far enough, that Scottish “Earl of Kintore” may find his way into our ancestry tree! Hello, i am just now reading the above. I am descendant of the Kippax family. My mother Neta and her uncle Alan have Falconer as second names. All material within this website remains the property of Virginia Rundle. For use permissions please contact the author.